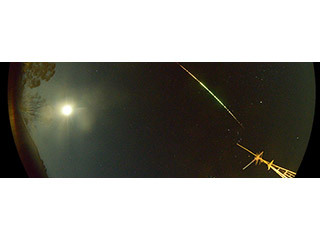 Fireballs in the Sky is a citizen science program whose goal is to better understand the origins of the solar system by observing the paths of meteors as they streak across the sky. With the help of volunteers around the world the pre-fall orbits of many of these meteors can be reconstructed; sometimes, the landing sites of a few of the surviving meteorites can even be pinpointed! 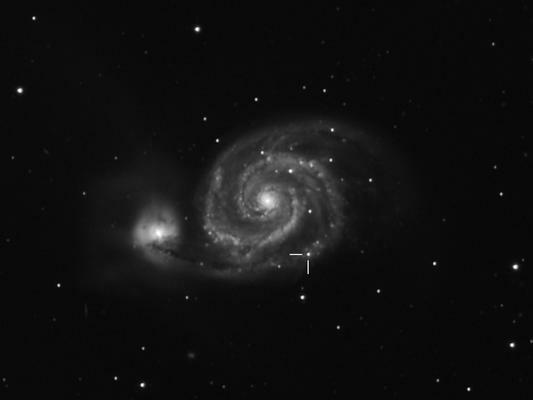 Find out how contribute your fireball observations to this project inside. 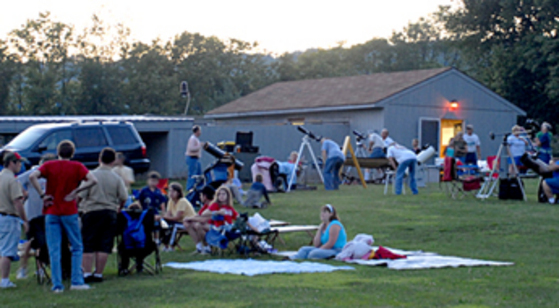 Night Sky Network astronomy clubs have reported more than 4 million visitors at their events nationwide. 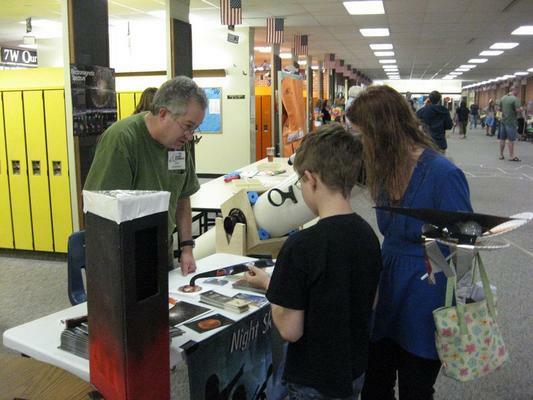 These events featured club members showing the public the wonders of the universe using NASA materials. 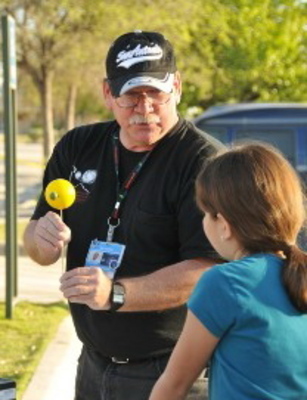 Congratulations to all the hardworking outreach volunteers at clubs around the USA! 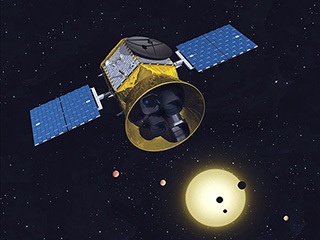 NASA's Transiting Exoplanet Survey Satellite (TESS) launched on April 18, 2018. 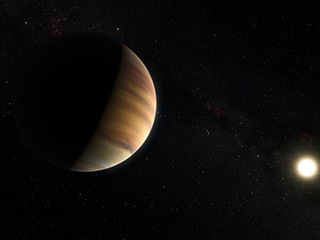 Its goal: survey the sky and find thousands more extrasolar worlds. The stars it will see will be perfect for followup studies by other telescopes as we search for potential Earth-like worlds. Find out more inside! It's April, which means it's time for Global Astronomy Month! #GAM2018 brings more astronomy fun, this month themed around a familiar, unifying sight in our night skies: the Moon! 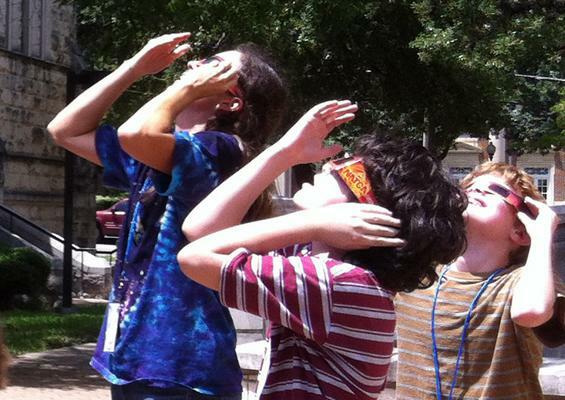 How Did Astronomy Clubs Prepare Their Communities for the 2017 Solar Eclipse? 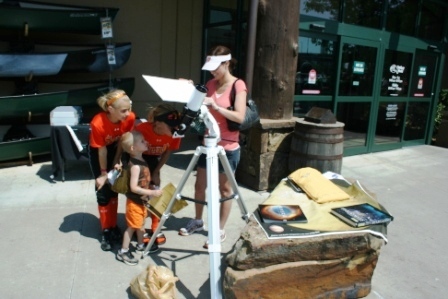 Night Sky Network clubs helped prepare their local communities for the total solar eclipse of August 21, 2017. 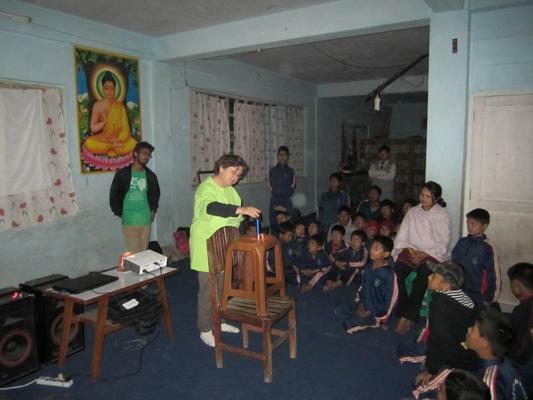 Our latest article showcases some of this incredible outreach in their own words and photos! 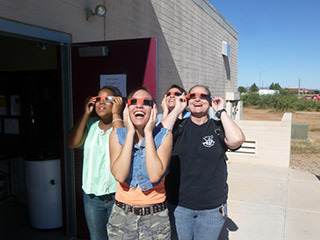 Find out the different ways NSN member clubs helped prepare their communities for the solar eclipse inside. To make event reporting easier, you can schedule your events on your club's NSN calendar ahead of time. We ran a contest earlier this year to encourage clubs to do just that! Find out inside who the lucky clubs were that won prizes for scheduling their upcoming events in their club's NSN calendar for 2018. Want to catch up on the latest space news from NASA? 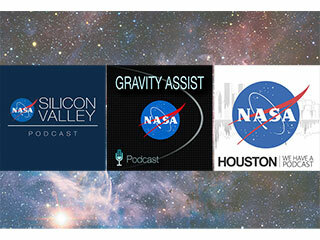 You are in luck, because NASA produces many different podcasts each week! 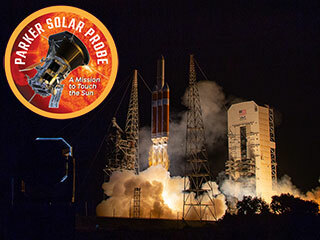 Find out behind the scenes information about space missions, the people behind the science, the history of NASA, spaceflight news, observing tips for amateur astronomers, and many more space-related topics. We have more details inside. 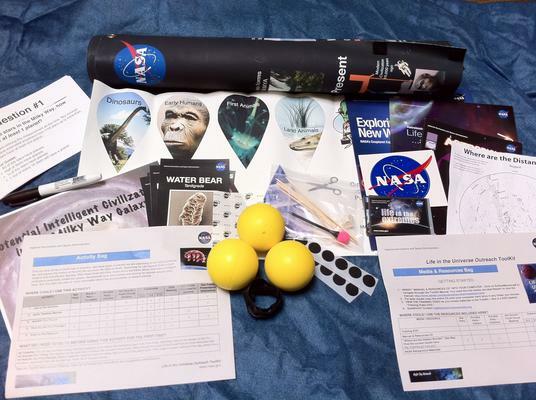 Hundreds of museums across the US are receiving space science kits from another NASA Network this winter. 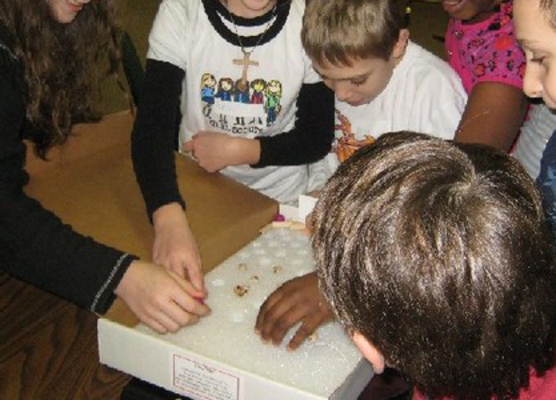 It's a great time to reach out and collaborate on programing with your local museum and help bring NASA science to your community with these new outreach materials from the National Informal STEM Education Network! Early morning risers in North America will get a special early morning breakfast treat on the morning of January 31: a total lunar eclipse! You can find tips on how to observe this special celestial event inside, with links to additional NASA resources and outreach activities. 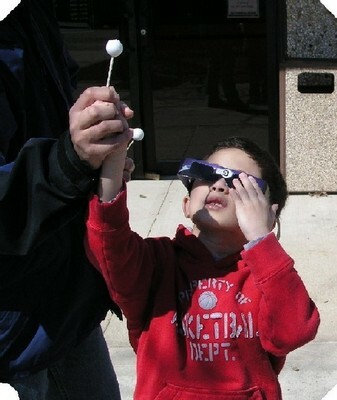 You may even be able to find an eclipse viewing party near you hosted by NSN member clubs by checking out our event calendar! We've compiled a list of our own frequently updated articles about common astronomy topics you can use for your newsletters. We have posted articles about many topics that your audiences might find interesting, and you can customize them for your own audiences. Find out more inside. "Supermoons" can be used as a teachable moment for folks interested in astronomy, despite their hype. 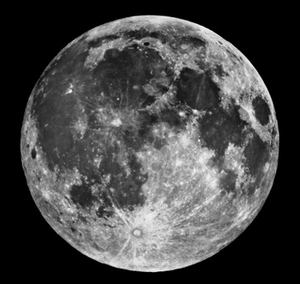 You can use interest in the supermoon to talk about the moon's orbit and why its size is different- as well as attract people to your star parties for amazing views of the moon! 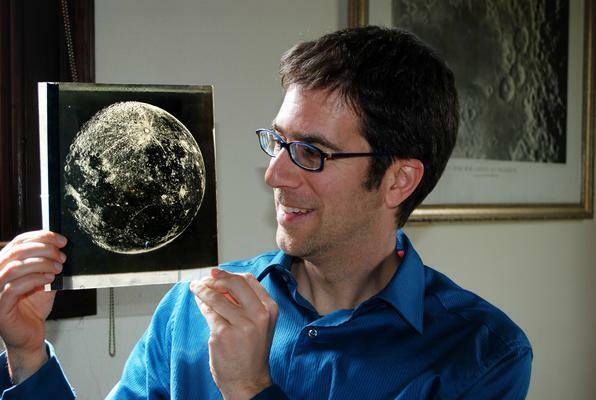 Congratulations to Paul Winalski, Winner of the Las Cumbres Award for Astronomy Outreach! 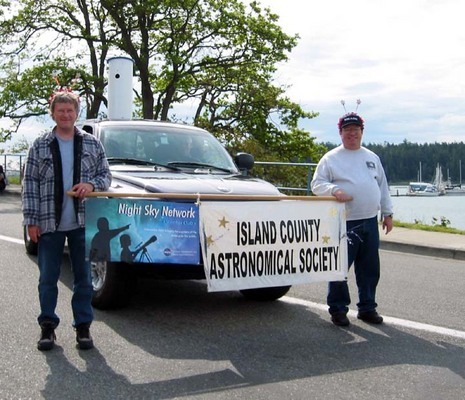 The Night Sky Network extends our congratulations to Paul Winalski of the New Hampshire Astronomical Society on receiving the 2017 Las Cumbres Outreach Award from the Astronomical Society of the Pacific! 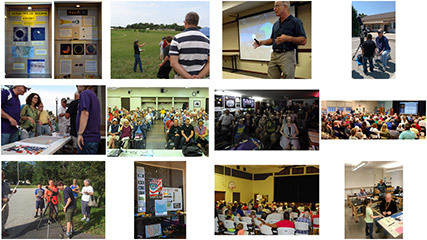 Paul works hard representing the NHAS at outreach events and has helped countless members of his community witness amazing views of the heavens. 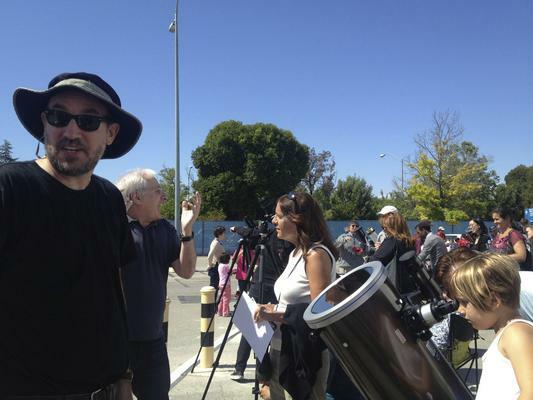 We got in touch with Paul to find out more about his love of bringing astronomy to the public and how he first got started with astronomy and his local club. Find out more inside! 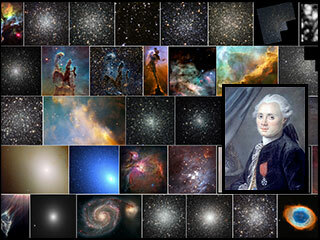 Hubble's Messier Catalog is a beautiful series of images over 230 years in the making! Charles Messier released his final version of his famed list of objects in 1781. In October 2017 the Hubble team released a series of gorgeous images of many of these objects taken by the Hubble Space Telescope. Find out more about the history of this list and where to find these amazing images inside! 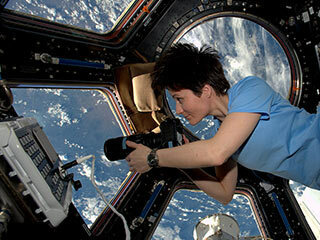 You can help analyze images taken by astronauts on board the International Space Station by becoming an Image Detective! This citizen science effort needs the help of human eyes and brains to help analyze the 1.5 millions images taken from the space station for use in better understanding our home planet. 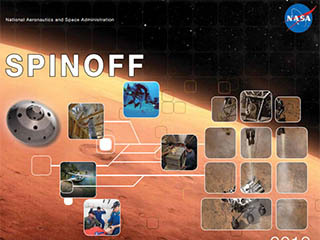 Find out how you can be a part of NASA science inside. 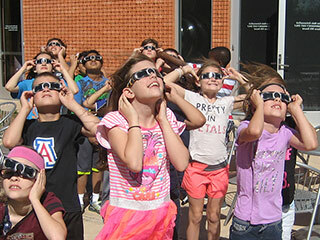 Your used eclipse glasses could be reused by schoolchildren in South America and Asia to witness the 2019 solar eclipse. 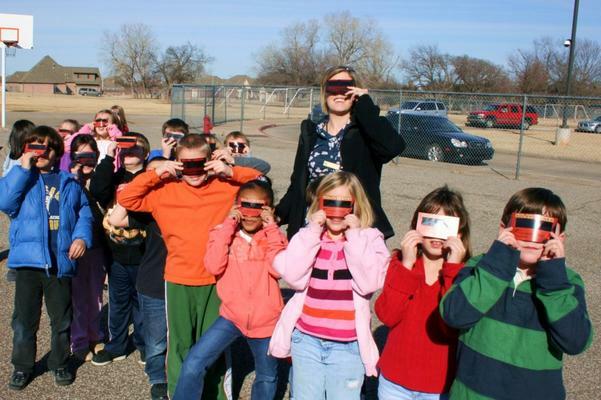 The eclipse glasses recycling program from Astronomers Without Borders and Explore Scientific helps keep safe solar eclipse viewers out of the landfill and brings them to schoolchildren that may not otherwise be able to safely view these eclipses. Find out more details inside- including what glasses are accepted, and where to donate them. 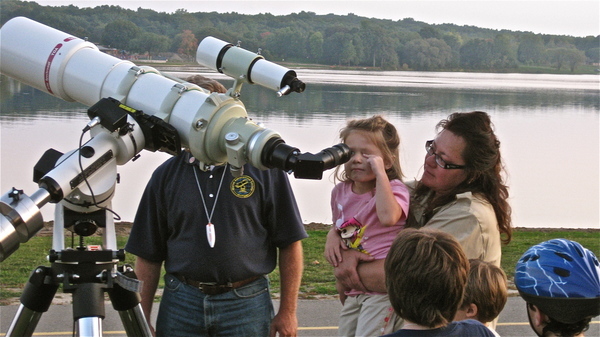 Celebrate Fall Astronomy Day on September 30! 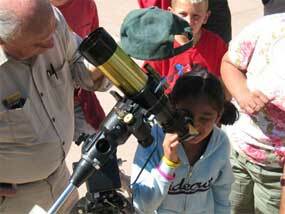 Astronomy Day is a world-wide event observed each spring and fall. 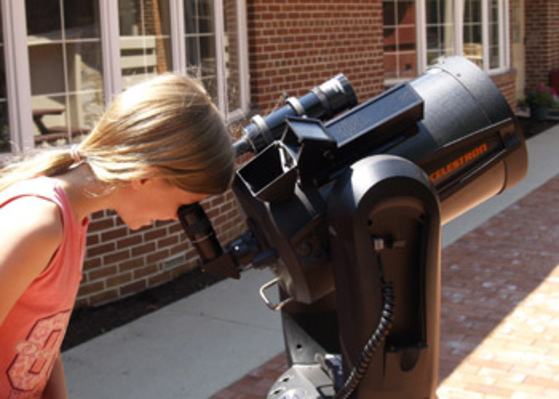 Fall Astronomy Day arrives on September 30, 2017. 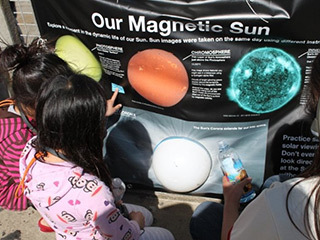 Local astronomical societies, planetariums, museums, and observatories will be sponsoring public viewing sessions, presentations, workshops, and other activities to increase public awareness about astronomy and our wonderful universe. Summer star party season is upon us! But what happens when rain or inclement weather rolls in, and you need to do something with your visitors while you wait for the skies to clear up? Well, after you double check to make sure you've safely stashed your telescope, try out one of these popular night sky network presentations for your audiences! We've found the top ten most popular NSN presentations from the past year and now present them to you. 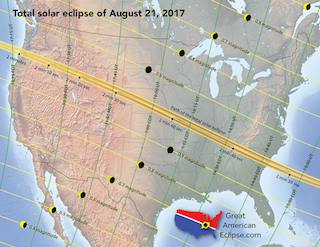 On August 21, 2017 a total solar eclipse across a small path across the continental United States - and much of the rest of North America will be able to see a partial eclipse. You don't want to miss it! 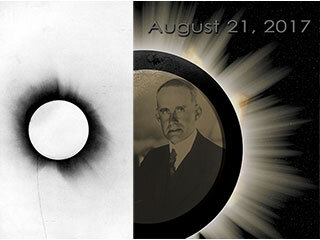 Find links to fantastic resources about this exciting cosmic event inside this article, and ensure that your eclipse viewing experience is safe and fun! Member Updates for August - Eclipse 2017! The eclipse is coming! The Night Sky Network staff will be traveling to the path of totality and will be back by the end of August. 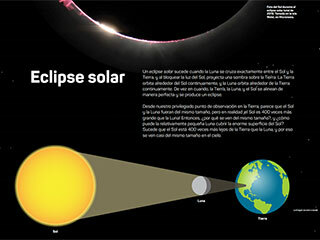 We do have a bit of news, including tips on eclipse resources, inside! Also, please note that we will not be hosting a webinar this month. Our regular webinar series will return in September. 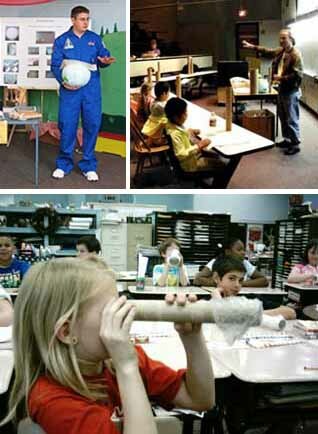 Check Out a Telescope From Your Local Library! 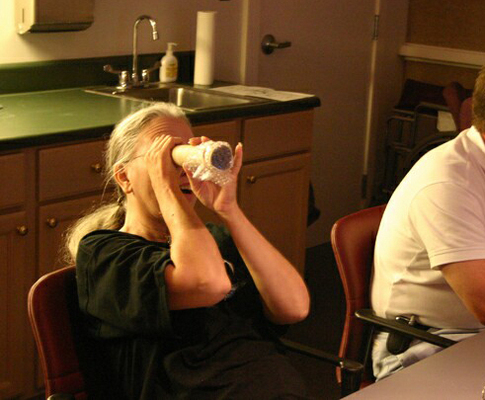 The Library Telescope Program brings telescopes to local public libraries, making good-quality and beginner-friendly telescopes available to curious patrons.The Astronomical League is now accepting applications to bring telescopes into more lucky libraries this year - find out how to nominate your local library for this program inside! You can join other citizen scientists and recreate one of the most important scientific observations of the modern era. Measure the positions of stars near the sun during the upcoming total solar eclipse to prove Einstein's General Theory of Relativity! Find out more about this astrometry-minded citizen science opportunity from NASA's Universe of Learning inside. 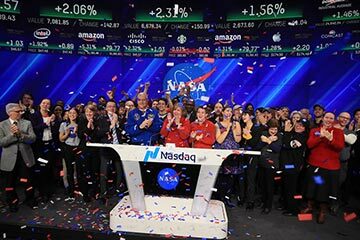 Blast Off with the Girl Scouts and NASA! 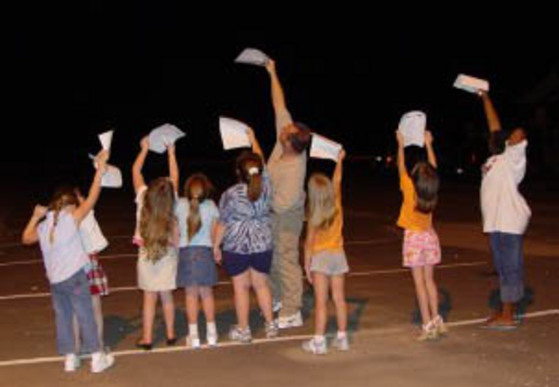 Congratulations to the lucky amateur astronomers and Girl Scouts who get to go to NASA Goddard Space Flight Center for a weeklong space science workshop as part of the "Girl Scouts: Reaching for the Stars" NASA grant! 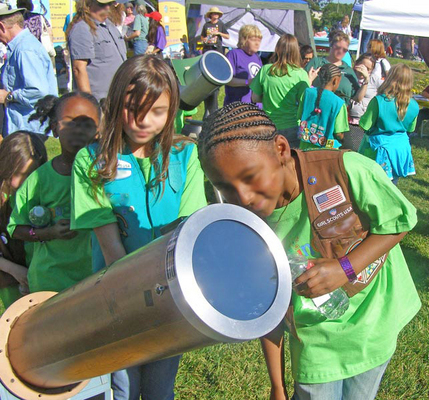 Amateur astronomers will be hearing more from Girl Scouts, both girls and adult volunteers, in the coming years as the Girl Scouts of America ramp up their own amateur astronomy programs. Find out more and get a peek at a few events inside. 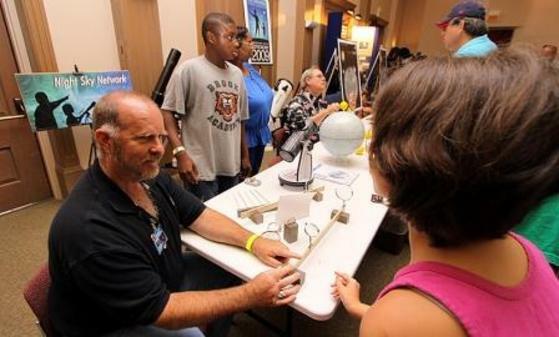 The Amateur Astronomical Association of Pittsburgh (AAAP) bring the stars to their local veterans with astronomy events at their local VA hospital. 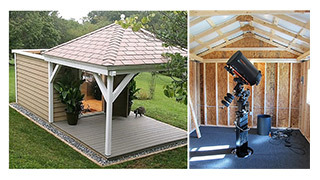 The members of the AAAP have even begun an effort to construct a dedicated observatory on the hospital grounds in an effort to provide additional astronomy activities at the hospital to help to aid in the recovery of the veterans receiving treatment. Find out more about their project inside! The Night Sky Network and the Astronomical Society of the Pacific (ASP) are proud to announce an exciting new program, "Reaching for the Stars: NASA Science for Girl Scouts." 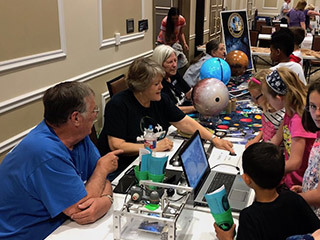 The team, led by the SETI Institute, is producing new space science badges, online Girl Scout volunteer materials, and new astronomy experiences for every level of Girl Scouts from Daisies in kindergarten through Ambassadors (Seniors in high school). What does this mean for you, our amateur astronomers? Find out inside! See how you can make your own materials in Spanish here. 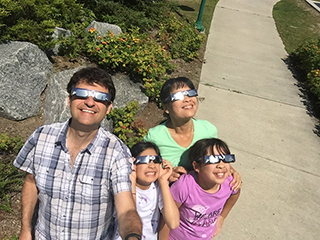 Andrew Fraknoi (Foothill College) and Dennis Shatz (Pacific Science Center) are recruiting amateur astronomers to help local libraries prepare the public for the August 21 solar eclipse! You don't need to be in town for the eclipse to help your neighbors prepare in advance for the big day - find out more on how to help inside. Here is our latest tip from Andee Sherwood, Club Mentor & Trainer for the NSN Program. This month, Andee goes into a deep dive on how to maintain your club's NSN homepage with the semi-hidden features inside the NSN's club management system. 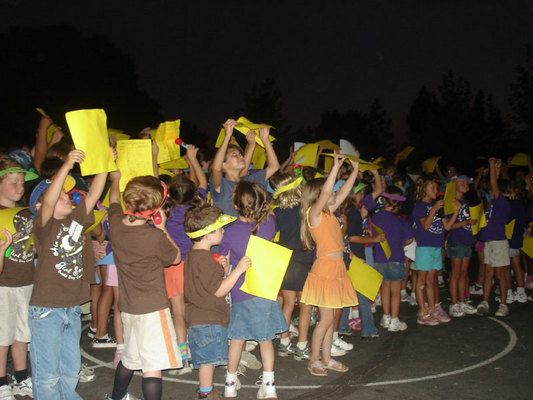 Find out how to maximize your clubs NSN presence inside this article. Global Astronomy Month is back for 2017! Global Astronomy Month returns for 2017 to pack April with exciting programs for astronomy enthusiasts worldwide. Whether it's stargazing, sharing with the public, or the cosmos in art, there is something for everyone in #GAM2017. 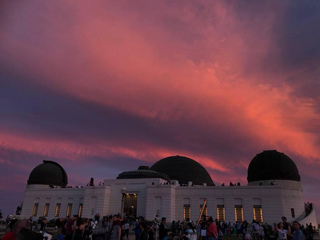 Find out how you can participate in these astronomical festivities inside! Join the Eclipse MegaMovie Project! The Eclipse Megamovie Project is now recruiting citizen science volunteers to help create a movie documenting totality of the upcoming eclipse of August 21, 2017. 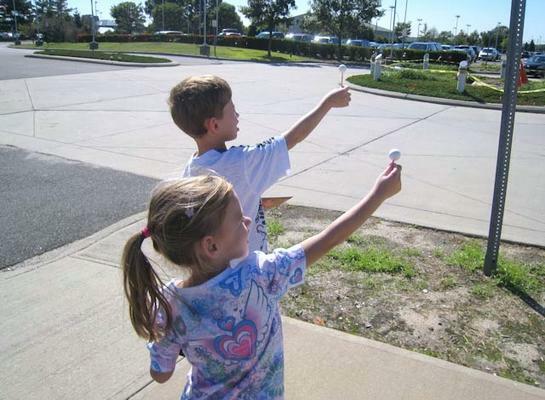 Find out how you can participate in this exciting citizen science project in this article! 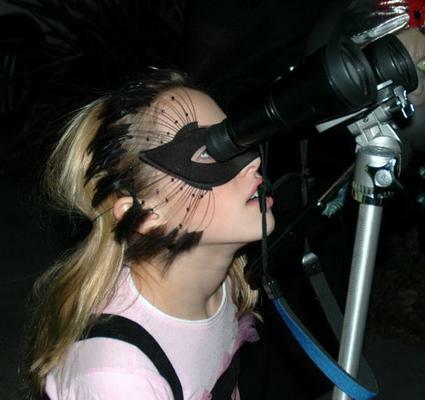 Find an Observing Program for You with the Astronomical League! Restart your interest in observing! Get to the next level in your skills! Get recognized for your long nights under the stars! 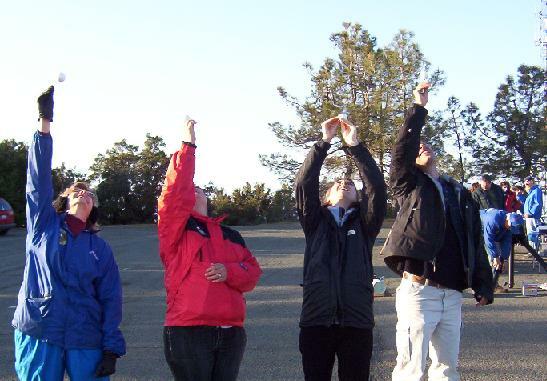 Join an observing program from the Astronomical League! 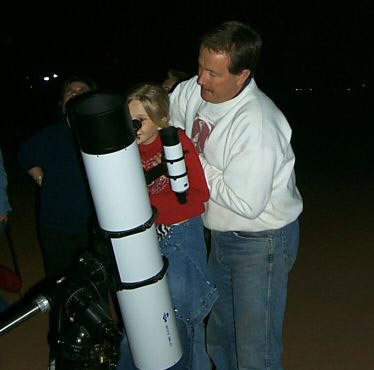 There are observing programs for astronomers of all levels and interests-from the most beginning beginner surrounded by light pollution, to the most advanced astronomer under dark clear skies, there truly is an observing program for everyone. Find out more inside! Exciting Updates to the NSN Website - check out all the new updates for clubs and club coordinators inside! Did you know that there are people who can help bring the wonders of the universe to Earth living right in your own community? 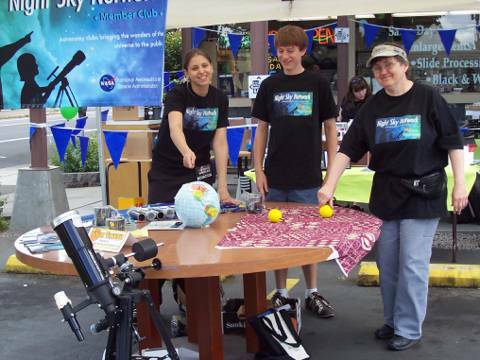 Find out how to partner with astronomers in your community inside this article! We want to make sure that your club is set for the end of this year! 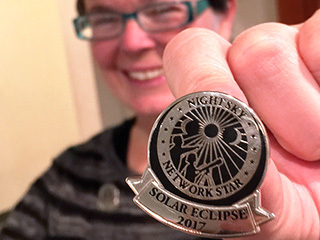 Get information inside this article on how to order astronomy outreach award pins for your club's volunteers, download the new outreach award certificate, and find out how to earn a free 2017 Solar Eclipse Education Kit for your club. Update- Our deadline for submitting events for Eclipse materials has been extended to January 31, 2017! 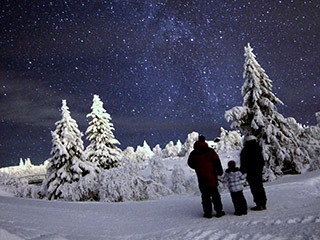 Winter Stargazing Tips: Stay Warm and Cozy! 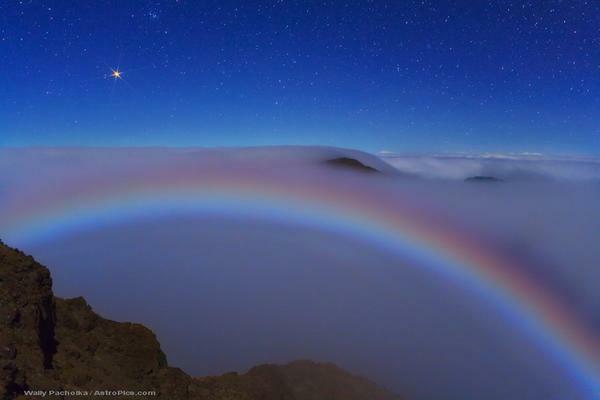 Some of the most impressive sights in the skies of the Northern Hemisphere are very prominent in the winter nights. Orion, the Hyades, and the Pleiades are all lined up and shine like jewels in the night, with many the constellations and deep-sky objects ready to take your breathe away. Just don't let the cold take your breathe away too! Inside, we have a handy guide for staying warm and comfortable on these cold stargazing nights. The holiday gift-giving season is upon us, and you may be looking for a telescope-either as a gift for someone else, or for yourself! 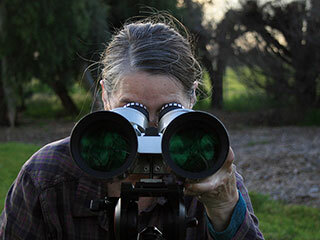 Find out what to look for in a first telescope (or pair of binoculars!) inside. 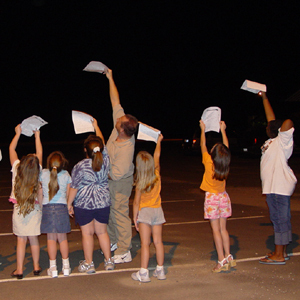 What do astronomy clubs do with the quarterly prizes they win from the Night Sky Network? 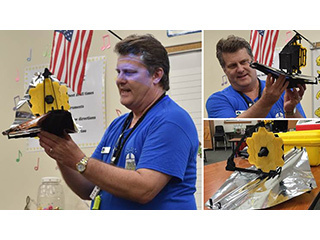 The Fort Bend Astronomy Club has used their prize of a James Webb Space Telescope scale model in various Houston-area outreach events as part of their Astronomy on Wheels program. Find out more inside! 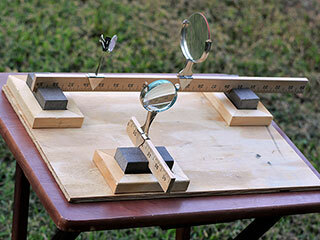 This is a great hack of the "Glass and Mirrors" Toolkit. 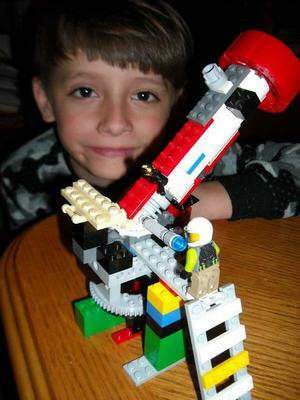 One crafty astronomer figured out how to create a sturdy light bench and a tripod-ready "naked telescope" demo using materials from this ToolKit. He even kept the dimensions super portable so the much-revised kit could still fit inside the original carrying case. Check out the details inside the article! 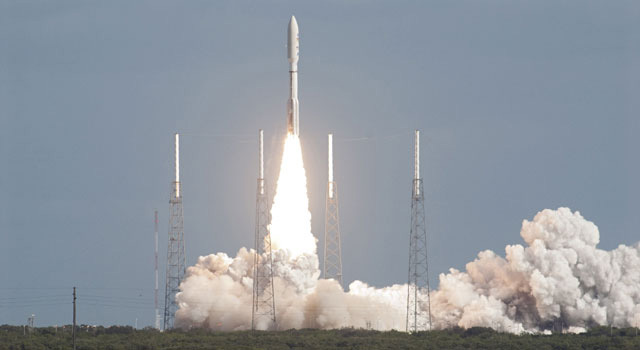 On September 8, OSIRIS-REx launched on a Atlas V rocket from Cape Canaveral on its mission to near-Earth asteroid Bennu. We have links to some great resources on OSIRIS-REx, Near-Earth Objects (NEOs) and other space rocks inside. Where Will You Be for the 2017 Eclipse? On August 21, 2017 a total solar eclipse will be seen across the US. 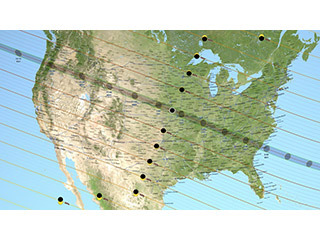 A partial eclipse will be seen from the 48 contiguous states. Get ready for the fun! Find out where to be and how to view it here. 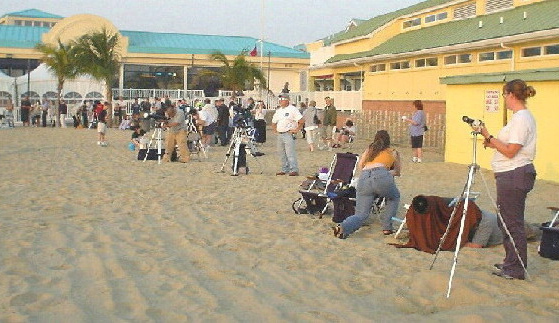 Great summer weather and a bit of vacation time will bring out the stargazer many people. 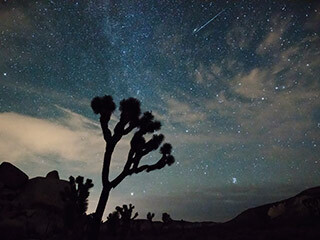 Warm nights and clears skies work hand in hand to create starry nights that people will remember for the rest of their lives...provided they aren't scratching at bug bites or a bad sunburn! 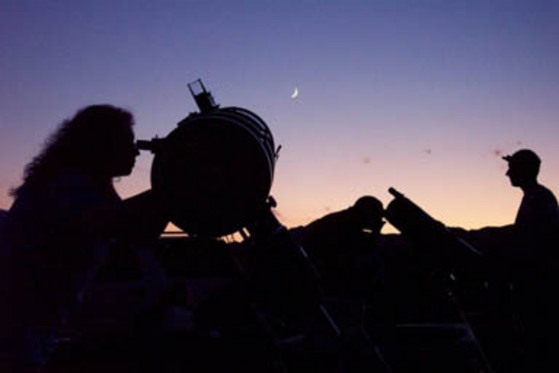 Make the most of your summertime skywatching with the handy tips inside this article, and stay cool. Join Juno's Jupiter Journey with JunoCam! 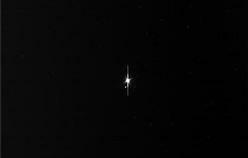 Juno slipped into orbit around Jupiter on July 4, 2016. 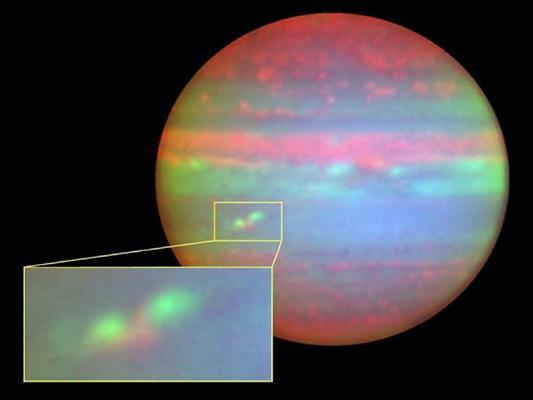 JunoCam will be taking specially selected close-up images of Jupiter's cloud tops, and you are invited to help in the imaging process as part of the citizen science imaging team! Find out more about the Juno mission and additional resources in this article. Amateurs get great pictures of Mars during opposition by using lots of preparation and skill with their preferred equipment at their observing sites. 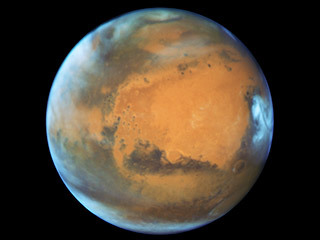 What kind of preparation does it take for scientists to get amazing pictures of Mars using the Hubble Space Telescope? We found out how by asking Max Mutchler, Research and Instrument Scientist at the Space Telescope Science Institute, who specializes in working with the Hubble Space Telescope's cameras! 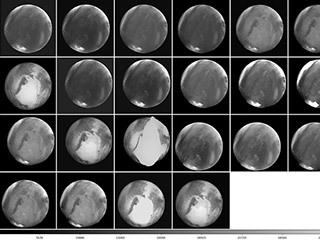 Check out his detailed answers inside this article and find out how the latest Hubble image of Mars was made. Observe the Opposition and Close Approach of Mars! 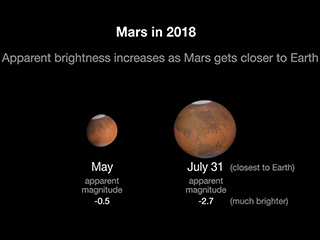 Mars and Earth will be at their closest for 2016 - and indeed, at their closest in several years - on May 30. 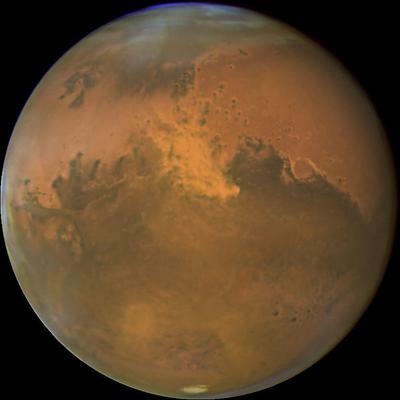 Mars is at opposition a few days earlier, on May 22. 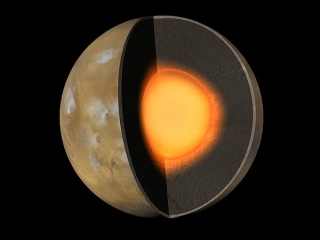 Find out what this means and how you can observe Mars through a telescope with your local astronomy club and find other resources about the red planet inside this article. 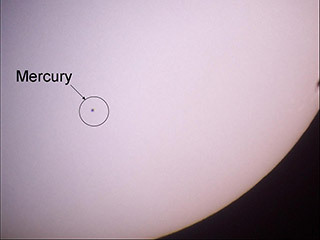 Thousands safely watched tiny Mercury's disc fly across the face of our Sun on May 9th with these tips and links to ways to watch it in both real life and online. Observers on the east coast of the United States were treated to the entirety of the transit, starting at 7:10 am EDT, and even though folks on the west coast had to wait until sunrise to watch the transit already in progress, it's worth it: the transit lasted a long time, about seven and a half hours! 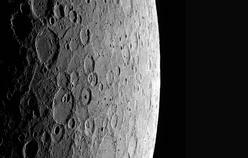 There are some exciting events coming up for NSN member clubs this exciting Global Astronomy Month, including another great telecon for members about Mercury and NASA's MESSENGER Mission! 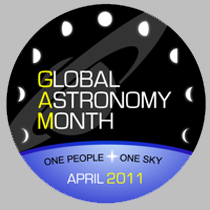 Global Astronomy Month 2016 (#GAM2016) fills the entire month of April again with exciting programs for astronomy enthusiasts worldwide. Whether it's stargazing, sharing with the public, or the cosmos in art, there is something for everyone in GAM 2016. 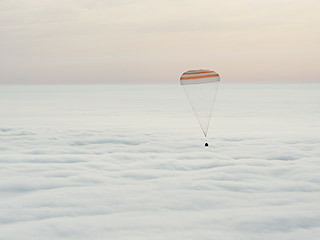 The crew has returned from the One-Year Mission. What are scientists hoping to learn from this long-duration stay on the space station, and what comes next? Find out more about their mission, as well as tips on how to spot the International Space Station as it passes overhead, inside. 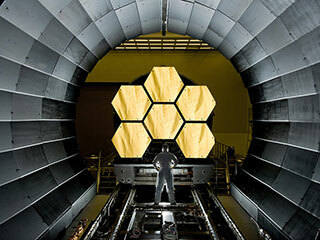 You can watch as the powerful next generation space telescope takes shape in its clean room. 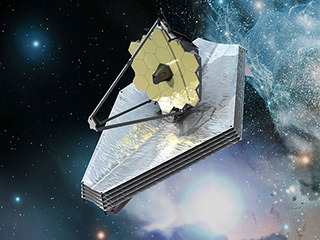 The James Webb Space Telescope (JWST) only has a couple more years on Earth before it will be launched into space to study the origins of the universe in 2018. In February the JWST hit a major milestone as all 18 of its primary mirror segments mirrors were installed. Find out more about how you can watch its progress as the JWST is assembled and readied for launch in this article. 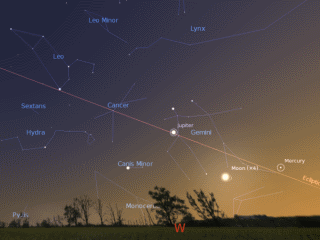 Want to see the five planets in the early morning but you aren't a morning person? Are you wondering what you can see in the evening skies, or other objects you can spot in the skies this month? We have a few resources you can go to that will help you plan your stargazing, both hosted by the Night Sky Network's website and elsewhere online. These resources will help you not just for stargazing in February, but for the rest of the year! 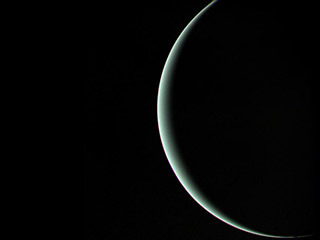 The plucky Voyager 2 space probe made its closest approach to the Uranus system 30 years ago this month, giving humanity our first close-up glimpse of this cold, giant world. Voyager 2 made many observations of the ice giant planet and it's many moons and rings, giving us an unprecedented view into this strange, topsy-turvy world at the edge of our solar system. 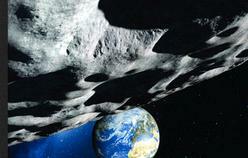 Find out more about what discoveries NASA made inside this article. 2016 Outreach Pins for qualifying clubs. A special prize drawing for clubs with upcoming events for 2016. 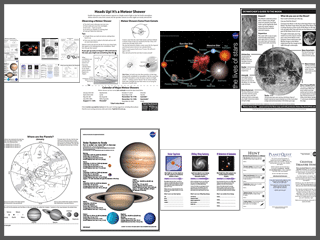 New outreach handouts are now available. News on current issues and upcoming improvements to the website. Take a look at these wonderful ways to recognize the dedication of your members doing outreach and opportunities to receive some great outreach materials. We want to take a minute and thank you, the dedicated and hard-working club members who make outreach happen. You are truly making a difference in the world, educating and inspiring the next generation. We salute you and look forward to supporting your inspirational outreach efforts for many years to come. We have tons of news you can use this month! Save the date: We have a special Night Sky Network members-only telecon on the latest results from the MAVEN mission on December 15th. We also have opportunities for citizen science with JunoCam and astronomy in Chile. We also have a few updates for clubs as the year closes, and some extra articles and resources as well. Check out our giant sized end of the year newsletter inside! 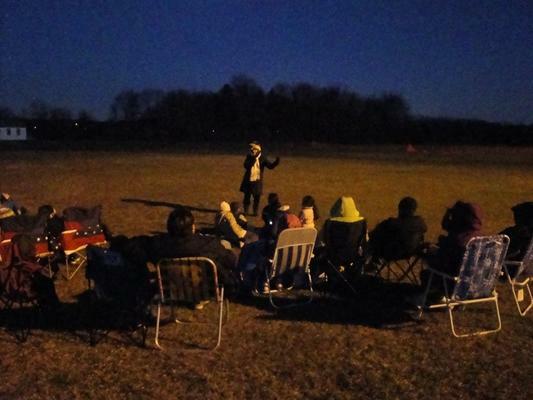 Fall and winter bring long nights and great times for astronomy overs! Find out what to look for in the evening and morning skies, including meteor showers, a dance of planets in the early morning, and some stellar constellations rising into full view after a long summertime absence. Congratulations to the latest quarterly prizewinners! Three member clubs won models of the James Webb Space Telescope by posting and logging their events on the Night Sky Network's calendar. Congratulations! Twenty years ago this month, the detection of the first planet orbiting a Sun-like star was announced. As we celebrate the anniversary of this historic discovery, we look ahead to see what discoveries we will make in the next twenty years and how we will make those discoveries. Update: Audio, transcripts, and slides are now available for download! 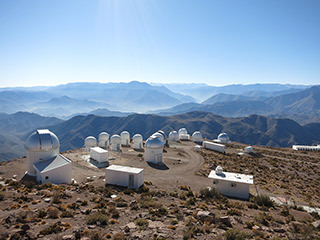 Night Sky Network members joined three of the Astronomy in Chile Educator Ambassadors to learn about the incredible array of professional telescopes high in the Chilean desert on Tuesday, October 20th. Details inside! 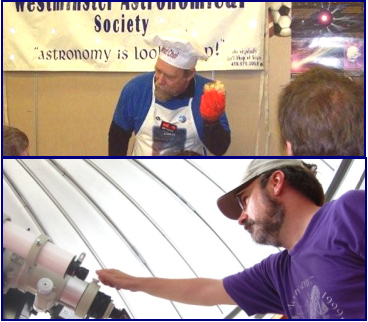 NSN member clubs are invited to host outreach events on White House Astronomy Night this October 19th. 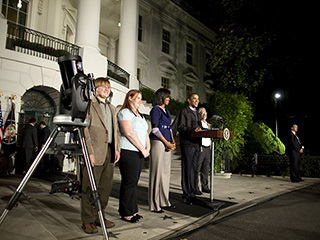 White House Astronomy Night events have been held since 2009, and serve to expand the public's knowledge of science, technology, engineering, and mathematics (STEM) in an informal setting and to entice young people to become the next generation of great scientists, engineers and inventors in our fast-paced and technology-driven world. 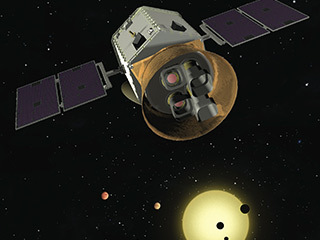 Hunting for exoplanets is not just for astronomers with years of training and specialized equipment-you too can join the hunt for worlds around other stars! There are many citizen science projects you can join to help find more planets and assist in the search for life around other stars. 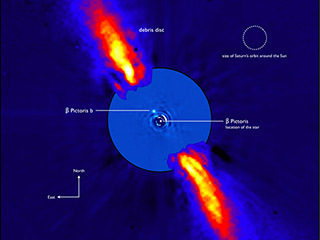 Amateur astronomers also help confirm exoplanets from their own backyards, and have even made a few discoveries of their own! 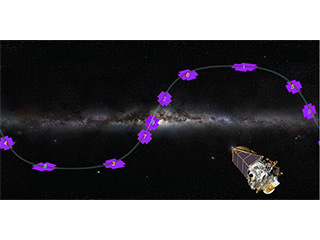 K2, the Kepler satellite's second mission, is still returning interesting science - it is not just about finding exoplanets any more, but measuring the light curves on many kinds of celestial objects! NSN Members joined us on for a special members-only telecon on July 21, 2015 at 6:00 pm PDT/9:00 PM EDT. 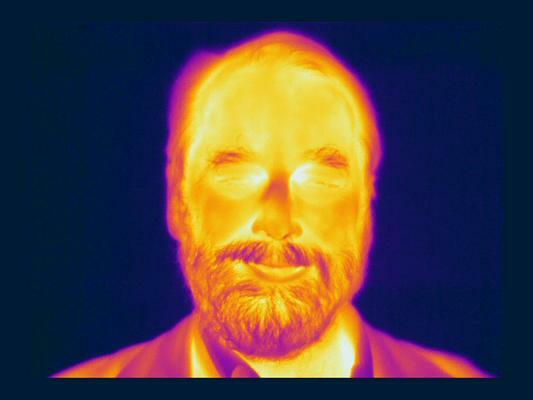 Our guest was Dr. Charles Beichman, the Executive Director of the NASA Exoplanet Science Institute. 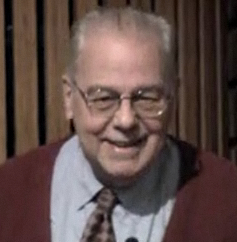 His talk was on 50 Years of Exoplanet Science: the View from 2045. Astronomers tried for years to discover evidence that worlds existed around stars other than our Sun. By the mid 1990's, technology had finally caught up with desire for discovery and lead to the first discovery of a planet orbiting another sun-like star, Pegasi 51b. Why did it take so long to discover these distant worlds, and what techniques do astronomers use to find them? 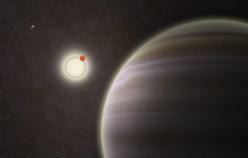 The first exoplanet found orbiting another Sun-like star was first discovered 20 years ago. Since then scores of alien worlds have been found and have completely changed our understanding of the Universe. These high-quality, low-cost volunteer-made telescopes are once again available for sale as part of the International Year of Light. 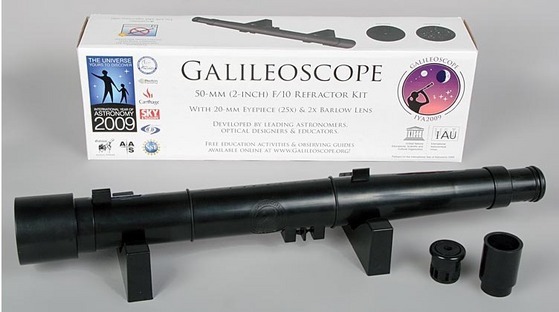 New Galileoscope kits start shipping this May! 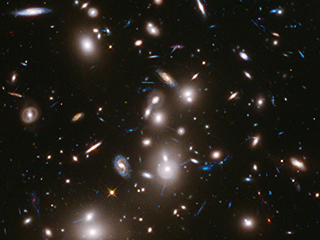 NSN Members joined Hubble scientist Dr. Brandon Lawton for a special telecon celebrating 25 years of the Hubble Space Telescope and the incredible contributions it has made to our understanding of our Universe, with a focus on its famous "Deep Field" images. 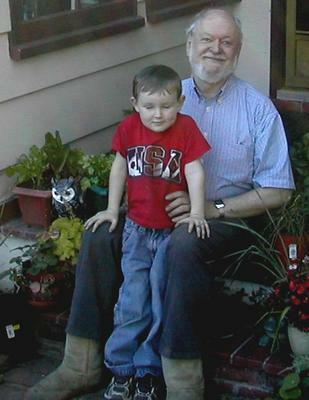 Updates, including audio, slides,and some Q&A with Dr. Lawton can be found inside. April is Global Astronomy Month! 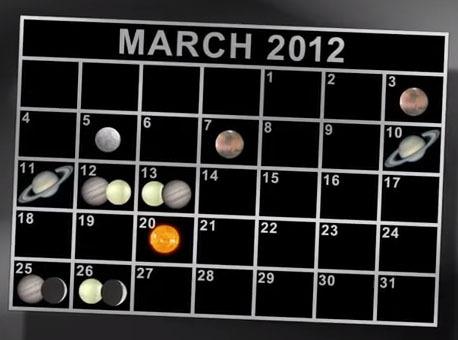 Astronomers around the world will be hosting many wonderful events to celebrate astronomy this month. Find out about special events and how to participate here. NSN members join us on Monday, February 23, 2015 for a presentation by Tom Bales of the ERGO Project, a citizen science project designed to place cosmic ray detectors around the world! 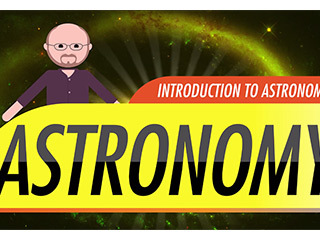 Take a crash course in astronomy! The Bad Astronomer, aka Phil Plait (who is actually a Good Astronomer) invites you to check out his new series about astronomy. You may be an astronomer and not know it! 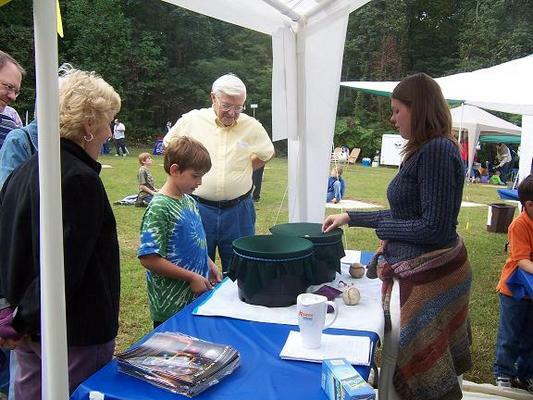 NSN club members really make a difference in the public understanding of the universe and change lives both young and old. 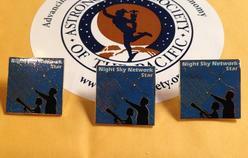 The Night Sky Network would like to help astronomy clubs thank those who have gone above and beyond in your club's outreach efforts with the Night Sky Network Star annual award pins. Read more to learn if your club is qualified to receive three free pins, and how to order more pins if you club has more deserving members! Fly with SOFIA in 2015! 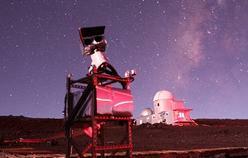 Want to fly with one of the most advanced telescopes in the world? 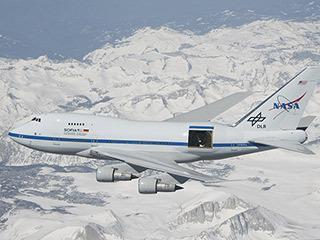 The SOFIA airborne observatory is now accepting applications for Airborne Astronomy Ambassadors (AAA) program for educators of all kinds-from teachers, informal educators at libraries or science centers, and yes-amateur astronomers! The full details and press announcement can be found inside. 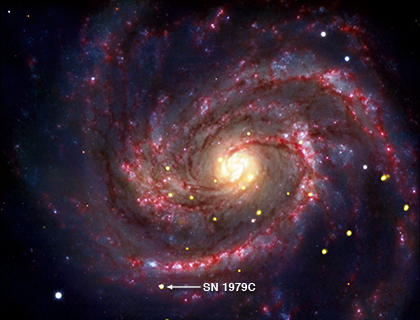 NSN Members joined Leo Heiland and Mike Simmons from Astronomers Without Borders for a telecon on November 18th, 2014. They discussed the latest initiative from the AWB, the Global Pairing Program: linking together clubs from around the world with clubs in the USA. NSN members enjoyed a lively Q&A session at the end with more details on this excellent outreach program. 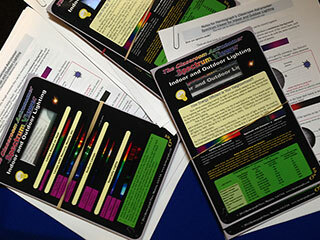 The latest news from the Night Sky Network for November including: a new telecon for NSN members with Astronomers Without Borders on an exciting new initiative for clubs around the world; a reminder to log your events to get more ToolKits and win a chance to get a quarterly prize; links to featured articles and resources. Comets have long been mysterious objects of astronomical wonder to mankind, who gazed in wonder and feared their approach. 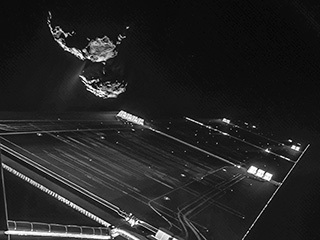 History was made on November 12: the ESA's Rosetta probe will send a small lander, Philae, down to the surface of Comet 67P/Churyumov-Gerasimenko, becoming the first spacecraft to safely land on a comet! 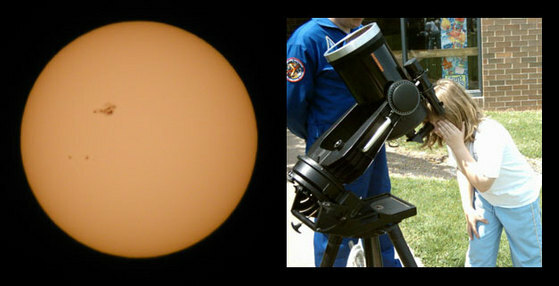 Want to safely observe the Sun during the upcoming eclipse? We have a few tips on how to do so without endangering your most useful observing tool-your eyesight! You can use many tools, from simple, cheap, and and safe eclipse shades and solar viewers, to sunspotters, pinhole projection, and special telescopes and glass filters. Find out what methods you can employ in here! Find International Partners for Your Clubs! Astronomers Without Borders is hosting a global pairing program for astronomy clubs, matching clubs around the world with clubs in the United States. Find out more in our special article for Night SkyNetwork members. This month brings lucky viewers in North America a full lunar and partial solar eclipse, meteor showers, a great view of an ice giant, and more! 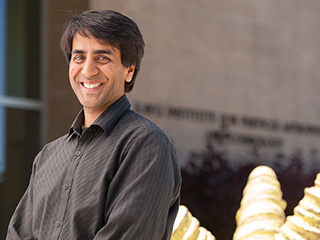 NSN members ioined Dr. Mandeep Gill from SLAC as he discussed his topic: Cosmological Insights from Gravitational Lensing, or How Herr Doktor Einstein Can Come to the Rescue and Help Us Solve the Grandest Mystery in Modern-Day Physics. Audio and slides from the talk are now available! 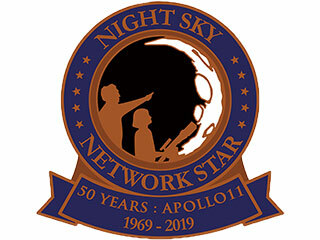 Congratulations to all member clubs of the Night Sky Network on reaching a major milestone: three million people have now been shown the wonders of astronomy by your hard working club members! 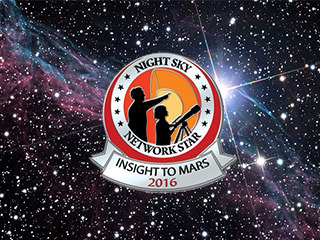 The Night Sky Network is doing a new survey of amateur astronomers located in the United States. 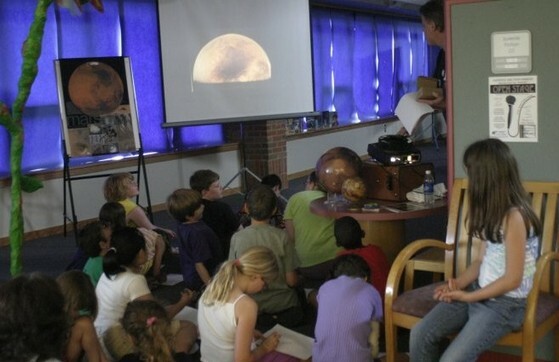 We are attempting to understand the landscape of educational outreach performed by astronomy clubs and assess the needs of the amateur astronomy community for the next 5 years. We want to hear your voice! Sunspotters Relaunched: Help Classify Sunspots! The Zooniverse has just relaunched their Sunspotters project. 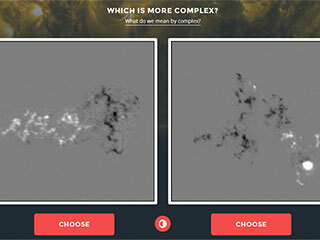 You can help classify complex sunspots! 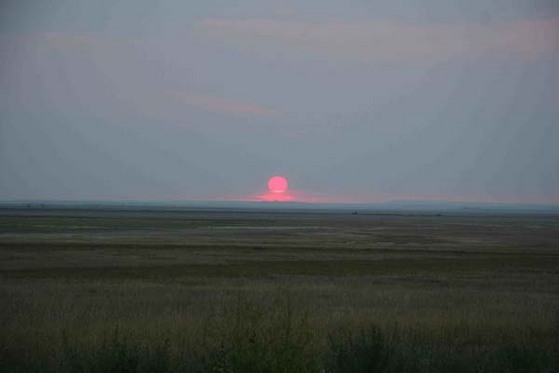 July 3rd marks aphelion, the day the Earth is the greatest distance from the Sun. 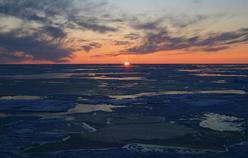 So, why is it so hot in the northern hemisphere? Well, because the seasons have nothing to do with Earth's distance from the Sun! 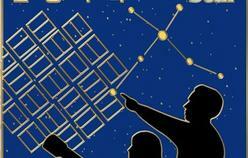 The latest news from the Night Sky Network for June 2014! Take a survey for a new ToolKit, prizewinners announced, and more news and updates! 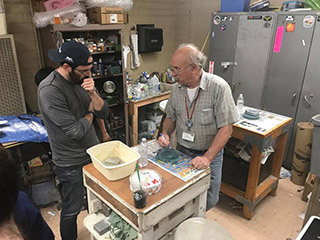 Congratulations are in store for Dan Kaminsky of the TSA Astronomers and NSN member club, who has received the prestigious Las Cumbres Amateur Outreach Award for outstanding outreach by an amateur astronomer! Congratulations to the NSN clubs who won Q1 Prizes! Ten lucky clubs who logged their events from January-March 2014 won the latest NSN prize! Check out all of the visible planets while you can! Late May and early June feature a fantastic month for lovers of the original naked-eye planets. 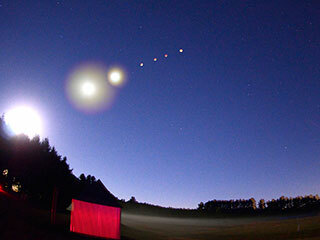 Mercury, Venus, Mars, Jupiter, and Saturn are all visible over the course of one night. What does NASA science do for me? NASA science may seem to be focused on the stars, but it all comes back down to Earth in some surprising ways. Find out more via NASA Spinoff. 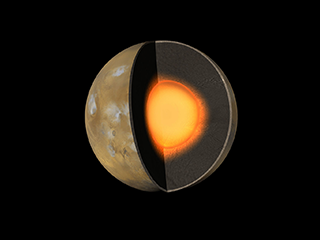 How do we see inside of a planet's crust? How do we know what makes up a planet? 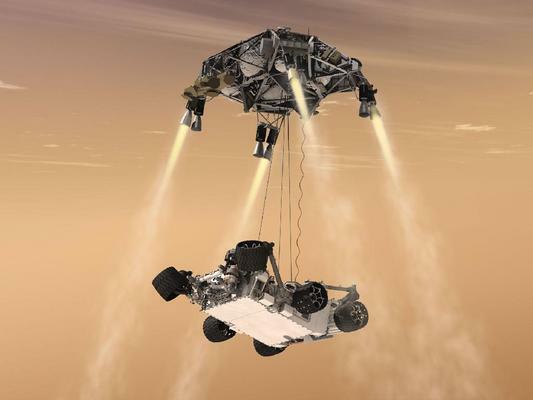 The upcoming InSight mission to Mars will use some clever detective work to help us figure out what is inside of our neighbor. There are big updates coming to the Night Sky Network webpage. Join us to find out what they are so you can prepare for this transition. 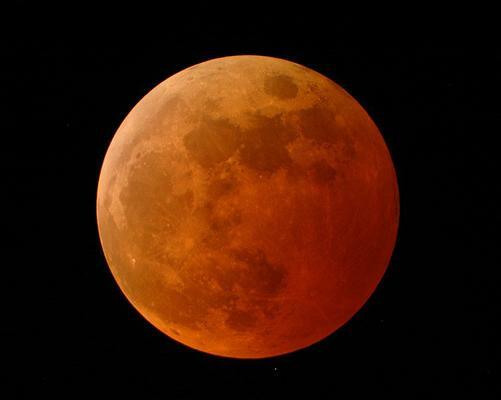 2014 promises to be a year full of gorgeous eclipses. Keep your eyes peeled for the first one this April! April News: Exciting Update to the NSN Website, and more! News for NSN in April, including a huge change for the NSN website and much more. A major update is coming the the Night Sky Network; members, check out our latest news below. Welcome to the greatest month of the year, where astronomy is celebrated with special events all month long! NSN News: Updates coming to the NSN Website! Updates coming to the look and feel of the Night Sky Network website; Telecon for March has been cancelled; and more! ToolKits now shipping to clubs! 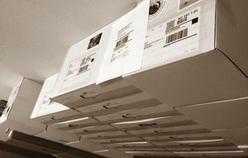 Toolkits are now shipping to clubs that qualified by logging their events in Q4 2013. Did your club log their events? 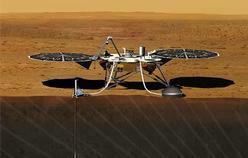 The Mars InSight mission will be launched in 2016 and will delve into the Martian crust in order to answer vital questions about how rocky planets form. Pins and Toolkits now shipping to NSN clubs; audio and transcripts now available from the NSN GaN telecon, and more member news inside! Connie Walker from Globe at Night joined NSN members for an illuminating talk on the GaN program, and discussed how you can become involved in the fight against light pollution by measuring sky quality. 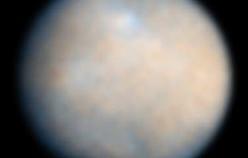 Ceres joins Europa and Enceladus as a formerly unexpected watery world. Does it also have oceans? Congratulations and heartfelt thanks to the hardworking clubs in the Night Sky Network community. Help discover and classify black holes! 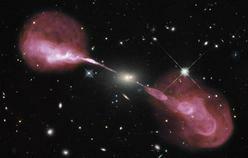 Galaxy Zoo Radio is a citizen science project where anyone can help find supermassive black holes by sifting through data collected by powerful radio telescopes. You too can get involved; maybe you will discover a powerful black hole! 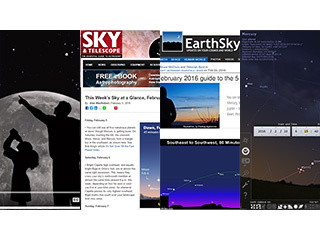 We are pleased to announce an exciting new resource for Night Sky Network members: Monthly activity guides and sky charts, in both white and red light versions. Believe or not, UFOs and alien spaceships are not the same thing. 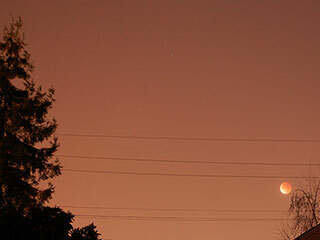 This article will help you help people identify those strange lights in the sky. 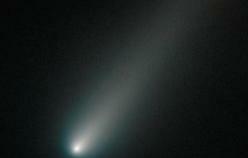 Comet ISON may be the biggest headliner this month, but there are some surprise visitors that may be visible in our telescopes and binoculars this month and next. Halloween is one of the only times where it is normal to see aliens, monsters, and astronauts walking together! 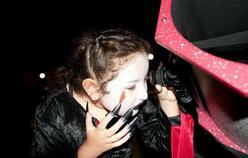 Why not show your little visiting ghouls the night sky for a special treat they won't forget? All about Exoplanets - New resources! Scientists are discovering hundreds, probably even thousands of planets around stars other than our Sun. 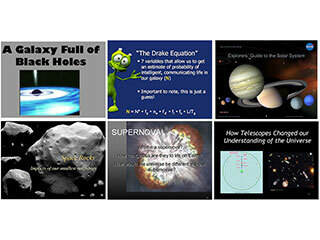 Learn all about these exciting new discoveries and use these activities, presentations, and handouts to discover more. 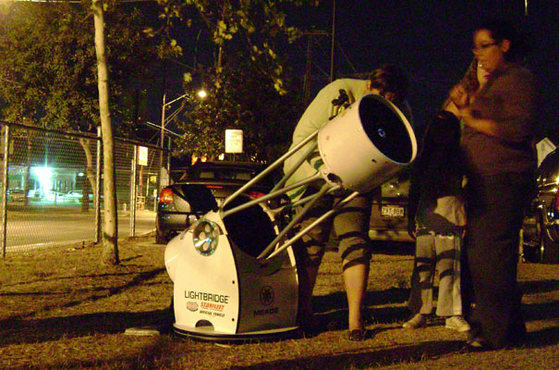 Night Sky Network members joined us on September 24th, 2013 for a fascinating talk with the team behind the Panoptic Astronomical Networked OPtical observatory for Transiting Exoplanets Survey (PANOPTES). Slides and transcripts are now available. 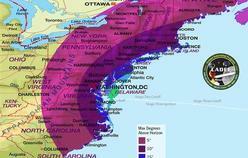 [Updated with footage of the launch] LADEE is about to start its voyage to the moon-and there are many events to check out to celebrate. Did you wave at Saturn-and its chief photographer- on July 19th at 2:27 PST? Want to help find space warps? 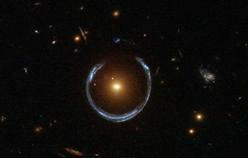 A new community project needs your help in finding images of gravitational lensing. 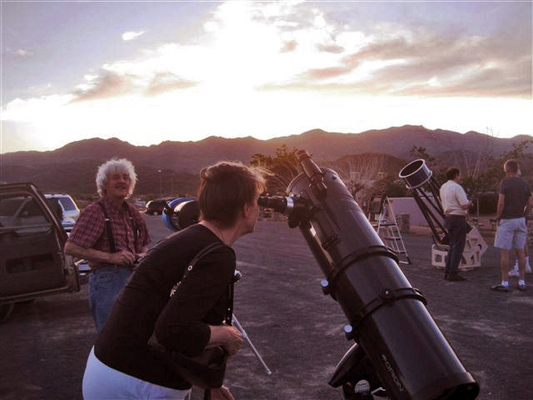 Skynet offers an amazing opportunity for free Astronomy courses with access to multiple telescopes around the world. 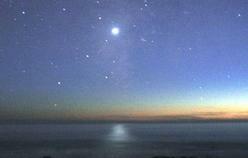 Mercury reaches its highest point in the western sky for 2013 this month. 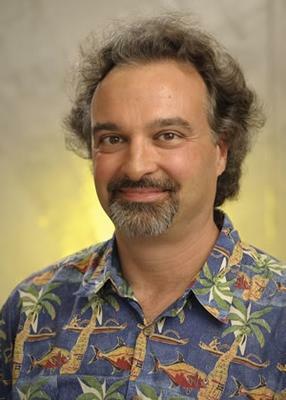 Dr. Cominsky gave a fascinating and extremely informative telecon on May 21st. Watch the trio of Jupiter, Venus, and Mercury as they perform a celestial tango in the west this month. Scientists need your help searching through images of our Galaxy. Many people use these terms as if they all mean the same thing. They certainly do not! 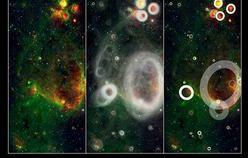 Find out what the differences are between a solar system, a galaxy, and a universe inside. Earth is a member of our Sun's family of eight planets. Which is the brightest other star that also has at least one planet? 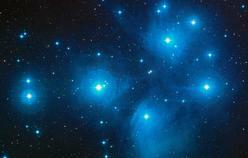 Born while the dinosaurs were roaming the Earth, the Pleiades sisters have been together about 100 million years. But soon, they may be leaving home. This was one of the best attended telecons we've held and for good reason. Check out the audio transcript to hear this engaging speaker. 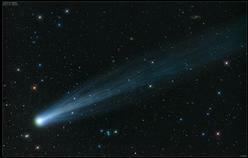 Comets and asteroids and NEOs, oh my! Here comes 2013 - be prepared. 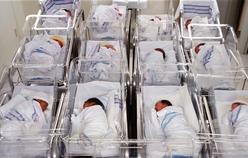 Ever seen a nursery full of newborns? No, not babies, newborn STARS. Now you can! 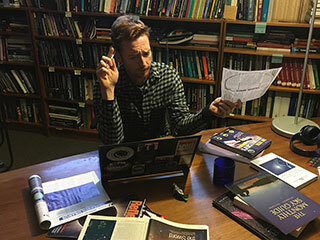 This aging star is still hard at work ... doing what? What's Up in Your Sky? Tell the World! The world didn't end on December 21st, but what DID happen? And what did it mean for Santa? There will be no end of the world! 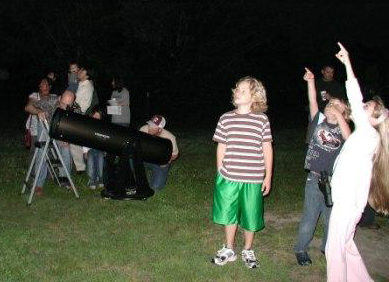 New to stargazing? Here's our advice on learning the sky! 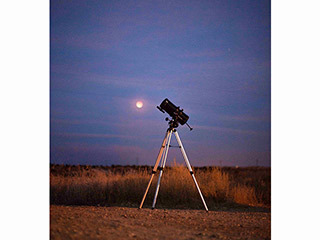 Amateur astronomy is more exciting than ever! 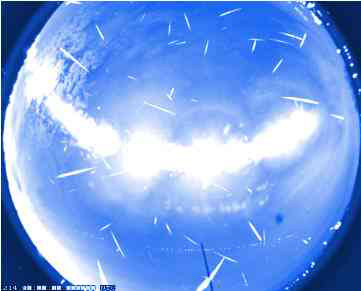 Orionid Meteor Shower & Astronomy Day! 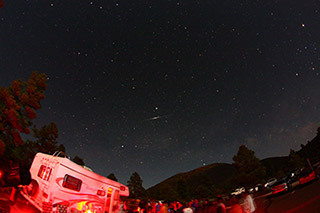 Enjoy an action-packed weekend of star parties and meteor watching! 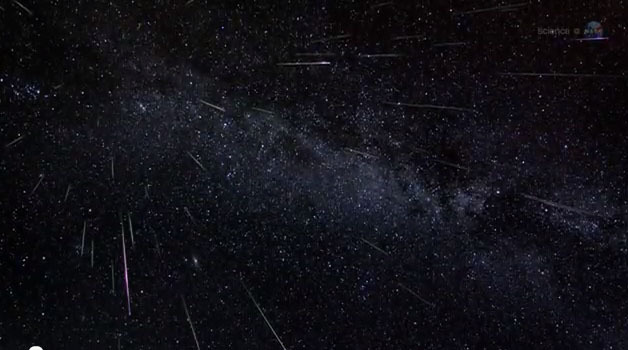 Heads Up, It's a Meteor Shower! 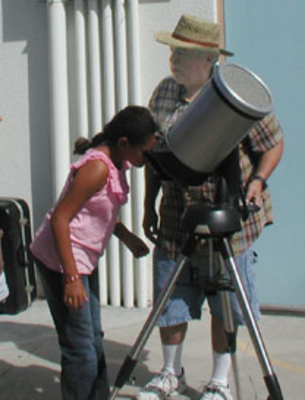 Congratulations to Chuck McPartlin of the Santa Barbara Astronomical Unit! 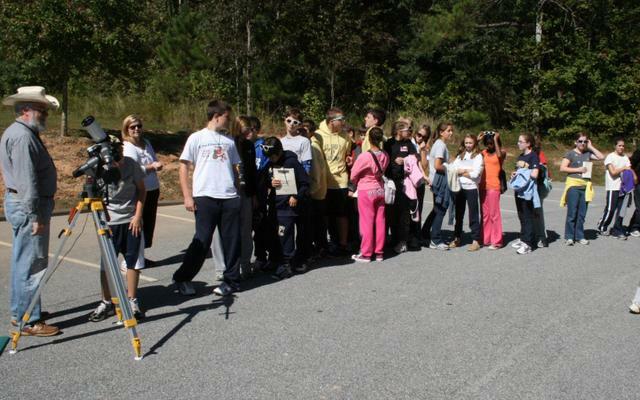 A fun way to get to know the Moon is with an astronomy club! 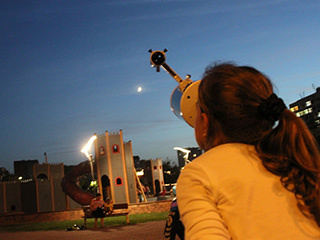 International Observe the Moon Night is September 22! 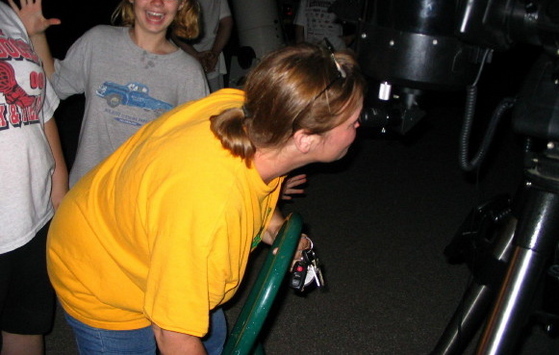 Find an astronomy club to see the Moon up close through a telescope! 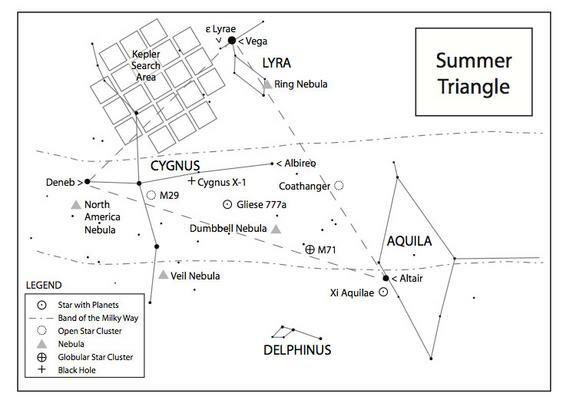 Get to an astronomy club event this summer! 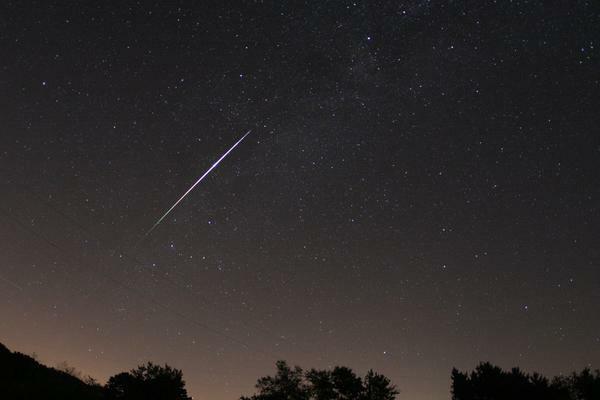 Watch the Perseid Meteor Showers! You can see them without a telescope! 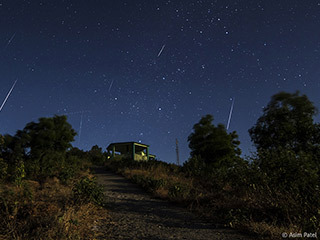 Read on to find out how to see meteors! 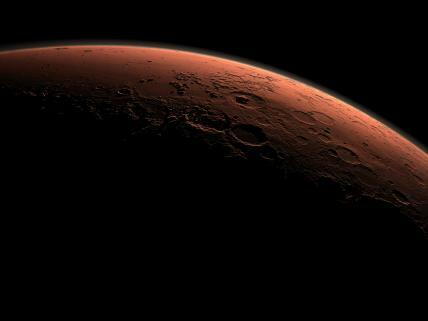 NASA scientist Dr. Ashwin Vasavada told us all about the Mars Science Lab scheduled to land on the red planet this August. Congratulations to the Quarterly Prize winners! Is your club one of them? 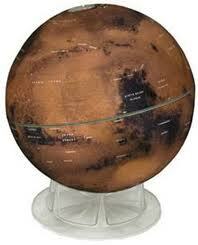 If not, learn how you can still qualify for a Mars globe. MarsGazers! Here's all the news and links you can stand about Mars. 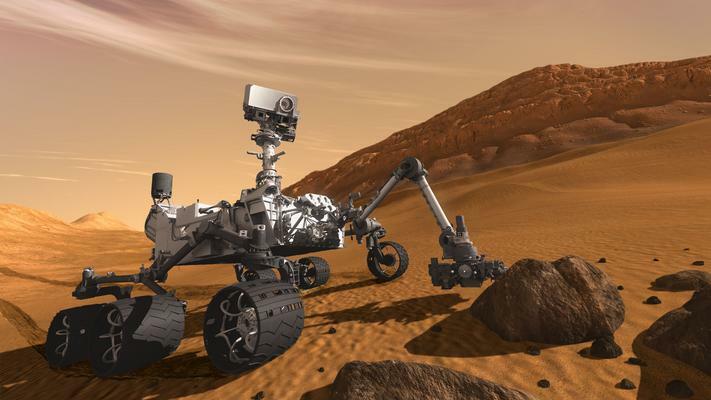 The Mars rover, Curiosity, will be on the Red Planet in August. Be sure to MarsGaze with an astronomy club! It's time for summer stargazing & solar viewing! 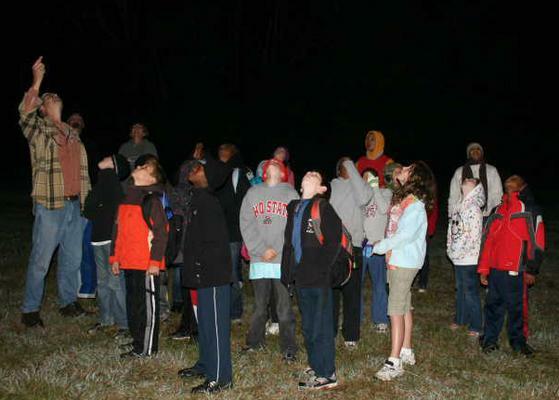 You'll love skygazing with an astro club! Thanks for your outstanding outreach! 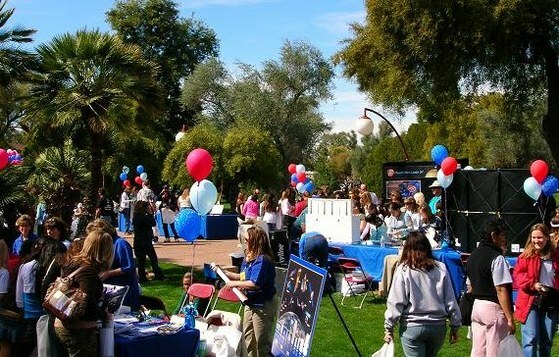 Find your astronomy club and go to fantastic events! 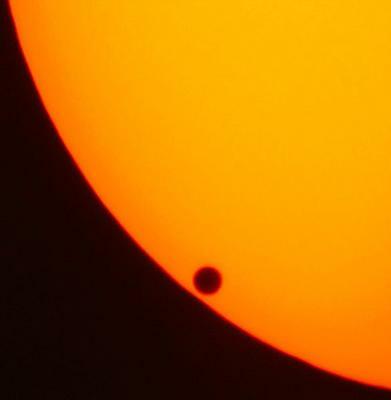 Watch the Transit of Venus with an Astronomy Club! A Once in a Lifetime Event on June 5-6, 2012! Listen to a solar Teleconference with Bryan Mendez. 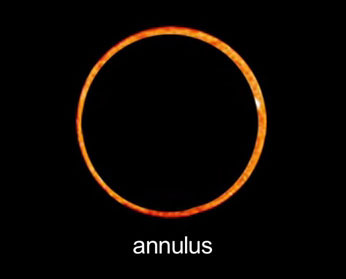 Get out to see the "Ring of Fire" annular solar eclipse with an astronomy club! 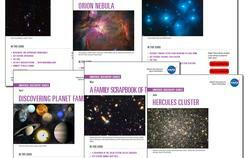 NASA Night Sky Network clubs inspire a love of the universe! After a star gazing or solar gazing event, you'll have a different understanding of the universe! 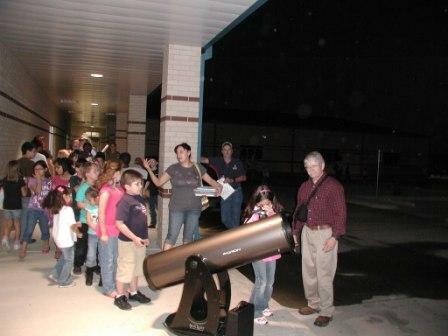 NASA Night Sky Network astronomy clubs have events during Global Astronomy Month and beyond for you to enjoy! Wow! 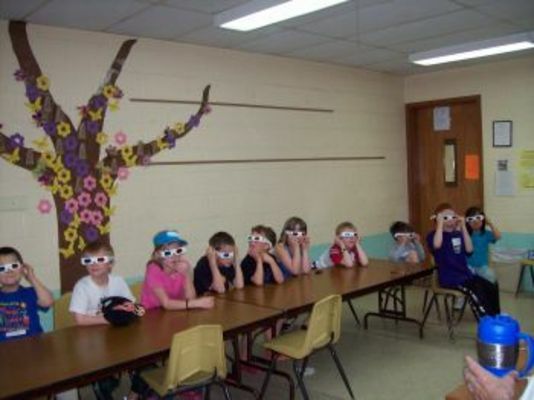 Imagine receiving 50 Solar Viewing Glasses for your outreach. Learn how these clubs qualified. 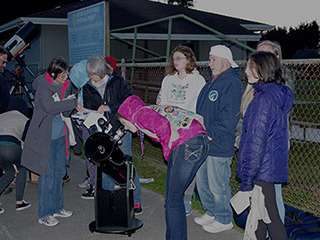 April is Global Astronomy Month and we want to see you at an astro club star party or solar viewing soirée! 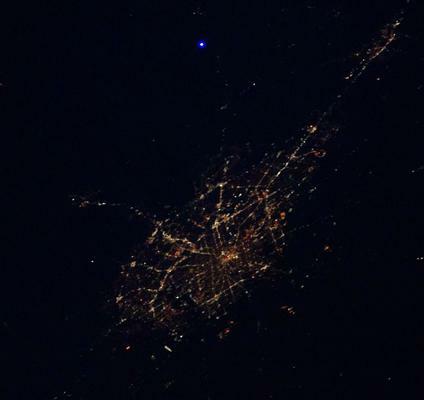 Amateur Astronomers Make History by Flashing the ISS! 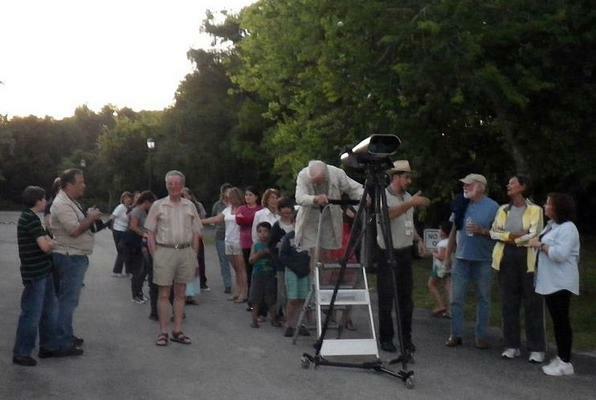 San Antonio Astronomy Association and the Austin Astronomy Society - Night Sky Network Clubs Successfully Flashed the ISS! 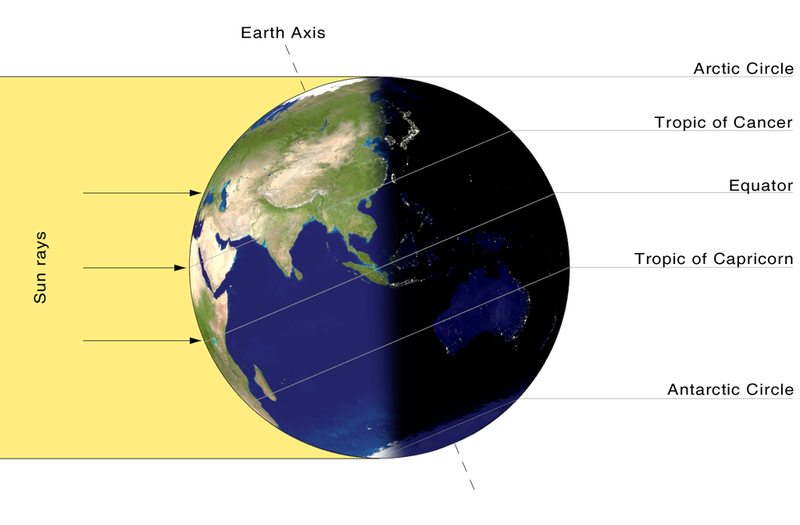 The Equinox is on March 20, 2012 at 5:14 Universal Time! 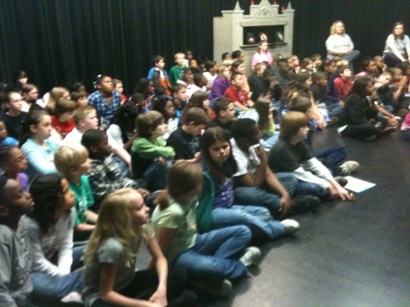 Dr. Aveni told us all about the 2012 craze and how to handle it with humor and facts. Transcripts available soon! 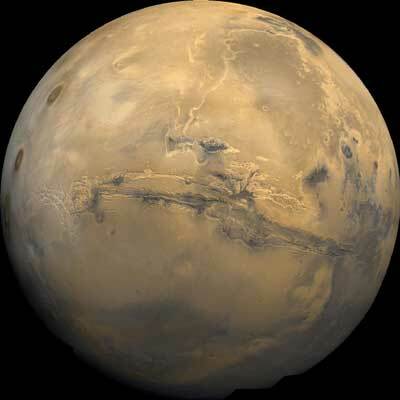 Get ready to see the Red Planet blazing away! Astronomy clubs are having lots of events and you're invited! 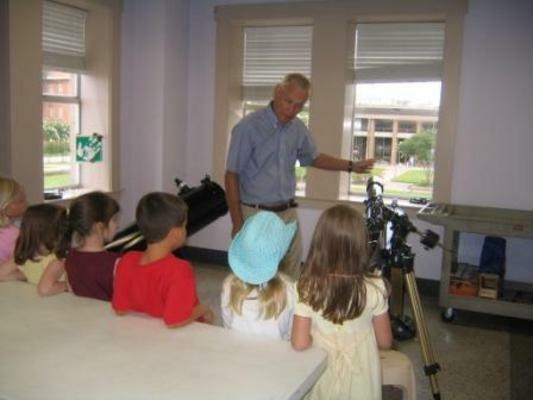 Introduce children & kids to astronomy so that they will have an enduring love of the sky! 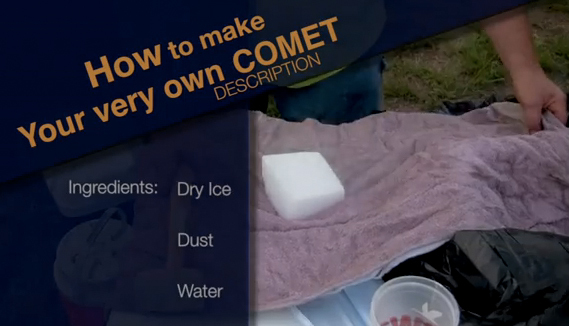 Want to Cook Up a Comet?! 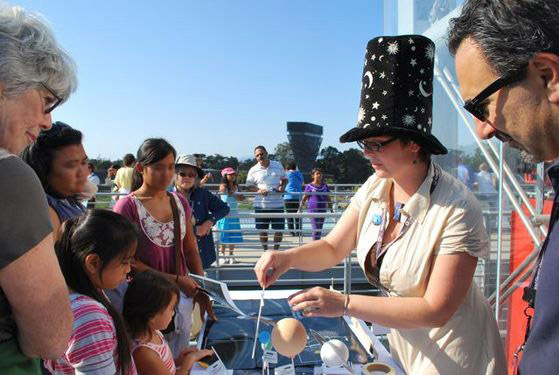 Club members do delightful astronomy demonstrations that you'll love! Fight for Your Right to Starlight! 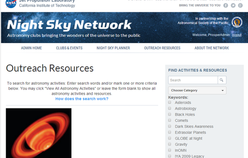 NASA Night Sky Network Astronomy Clubs Reach Almost Two Million People! 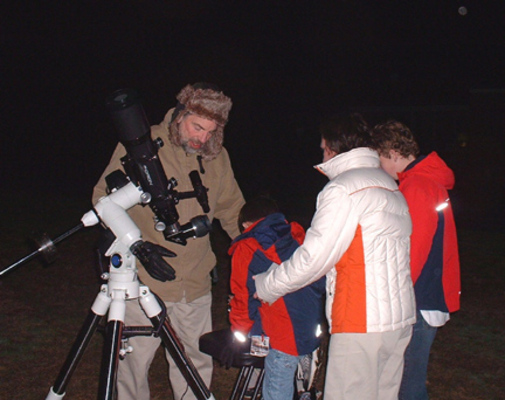 Astronomy clubs tirelessly share their telescopes and there are plenty of winter events so bundle up, brave the cold, and stargaze! 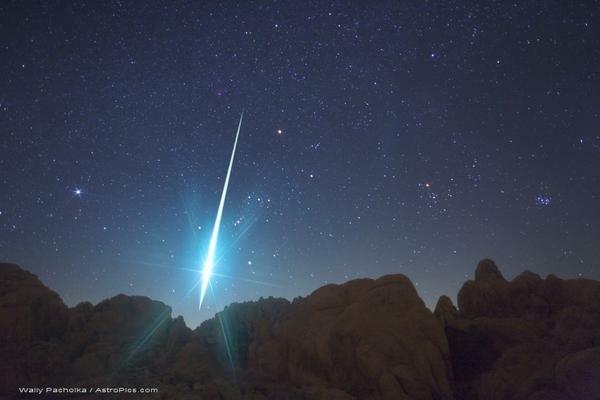 We invite stargazers to join the NASA Up All Night Chat and try to spot some meteors yourself! Are there seasons on Jupiter? Are there seasons on the Red Planet? 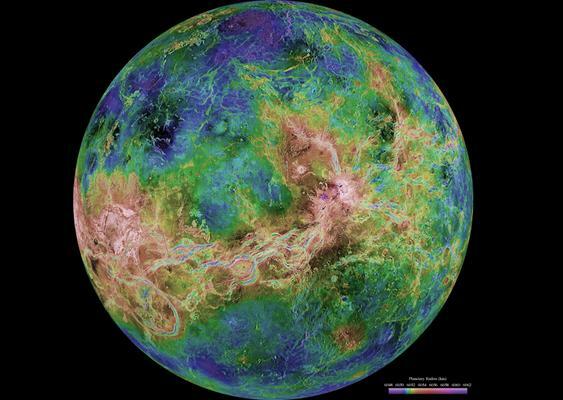 Are there seasons on Venus? 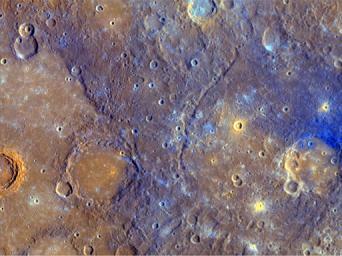 Are there Seasons on Mercury? Observers in the Northern Hemisphere wake up to coffee and an eclipse (watch before sunrise) and much of the rest of the world will watch the eclipse at night! You can see Mars without binoculars or a telescope, we'll tell you how! 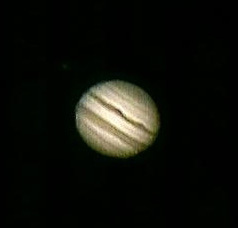 Jupiter is fun and easy to find! 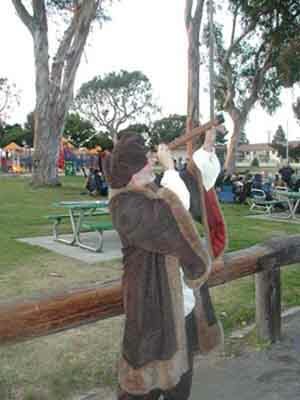 FREE Star Parties on Saturday, November 5, 2011 at over 20 sites in the San Francisco Bay Area! 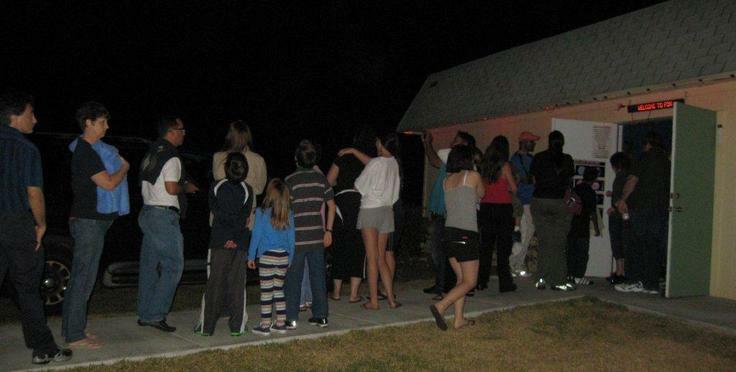 FREE Star Parties on Saturday, November 5, 2011 there will be star parties at over 20 sites in the San Francisco Bay Area! 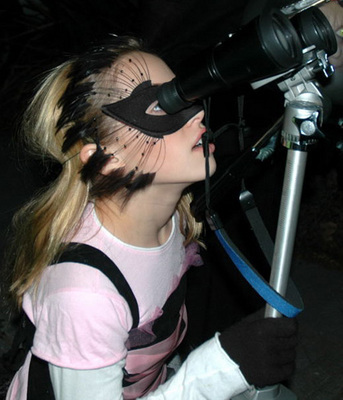 On Halloween, many amateur astronomers set up telescopes and binoculars on their lawns for trick or treaters. This Halloween, a waxing crescent moon and Jupiter will be visible in the east. Star Light, Star Bright, Can You See Those Stars Tonight? 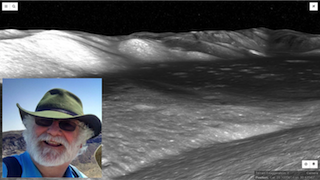 Congratulations to the winners of the International Observe the Moon outreach challenge! These five lucky clubs can look forward to a Moon Globe and a new lunar filter for their outreach activities. Pack the car full of friends and family grab some moon munchies, and go out to an astronomy club moon event! 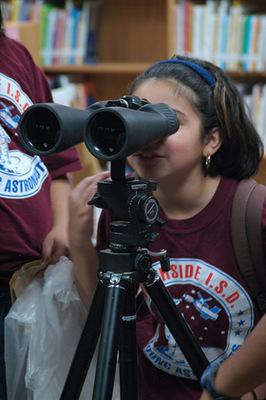 Houston Area Astronomy Day & International Observe the Moon Night: Five Texas Clubs Join Forces to Bring You the Universe! 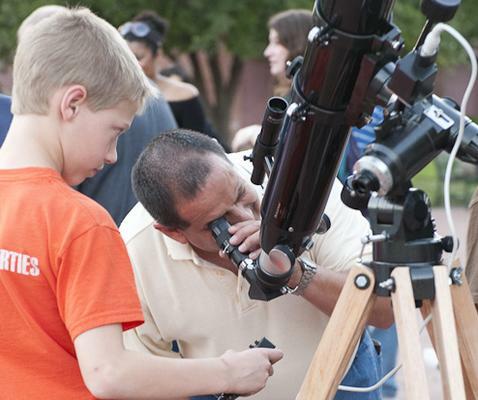 Free Texas-Style Astronomy Fun on Saturday, October 8th! On Thursday, September 22nd, Dr. Ned Wright presented: Exploring the Dark Side of the Solar System with WISE. When the Moon hits your eye. Like a big-a pizza pie. That's amore! 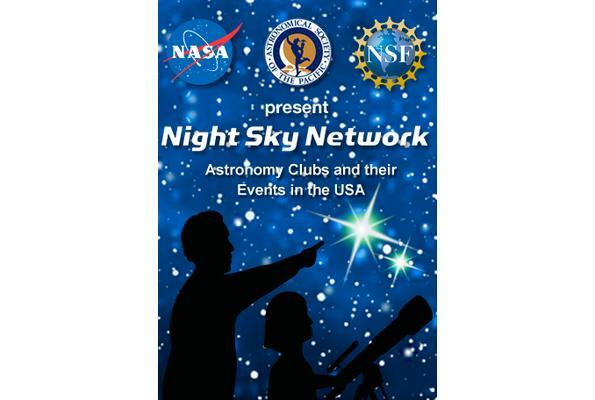 Celebrate International Observe the Moon Night with a Night Sky Network Club! 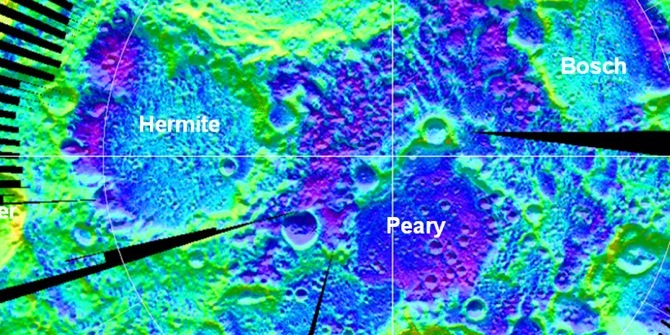 On Thursday, August 18, 2011, Brooke Hsu, held a telecon entitled The Changing Face of Earth's Nearest Neighbor: Science Results from the LRO. 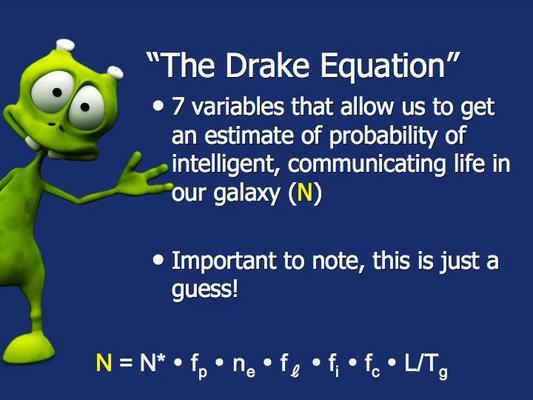 On Thursday, July 28th we held our Astrobiology Telecon with Dr. David Morrison. If you missed it, check out this article. Congratulations to our Summer Quarterly Winners! 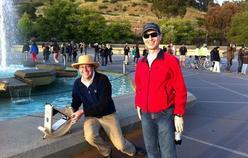 Check out our Summer Quarterly Prize winners of Lunar Phase Pro, the "Swiss Army Knife" of Moon observing software! Night Sky Network Club Member Goes Global! 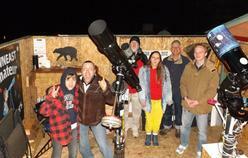 Stargaze with Award-Winning Astronomy Club Members! The Night Sky Network's latest ToolKit - Life In the Universe - is about to be released and you don't want to miss it! Be sure to log your club's events this quarter to receive one. 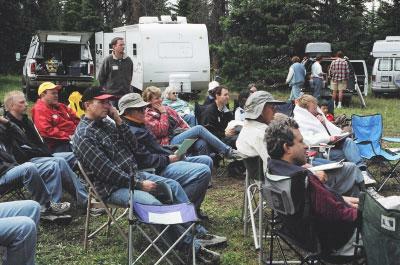 Get Ready for the Bryce Canyon Astronomy Festival & ALCON 2011! Astronomy Every Day, Even at a Mattress Store! The NASA Night Sky Network Helps You Fuel Your Love of the Sky! How do you keep up with what's going on in the sky? 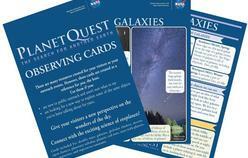 Get Your Free Sorting the Solar System Cards! 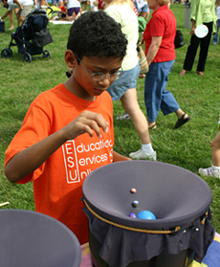 The Sorting the Solar System activity is a fun way to get to know our Solar System, and leaves room for plenty of improvisation. 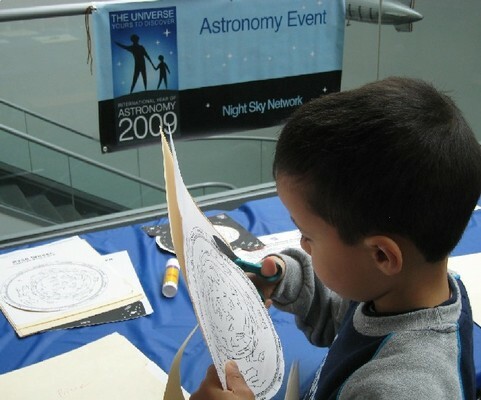 Celebrate Astronomy Day with a NASA Night Sky Network Club! 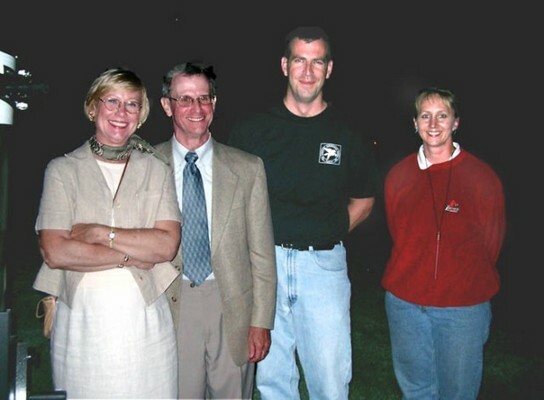 Happy 50th to the Warren Astronomical Society! Second Round of 2011 GLOBE at Night (GaN) Kits & SQM Winners! Was your club a winner? Here are the results of the Second Round of 2011 GLOBE at Night Kits & Sky Quality Meters (SQM) Drawing. Congratulations to our Spring Quarterly 2011 Meteorite Winners! 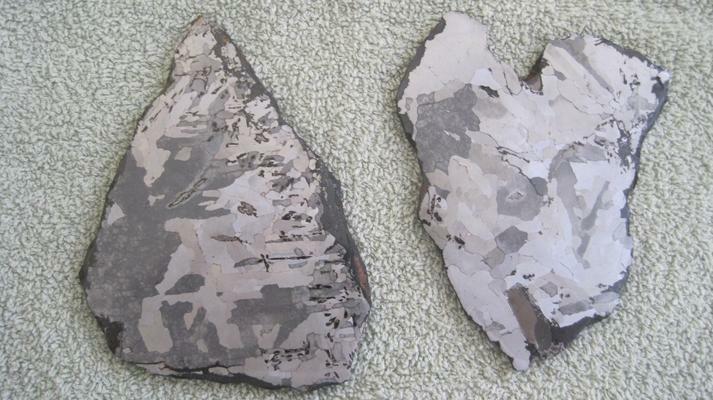 Check Out the Winners of the Spring Quarterly Drawing: 5 More Museum Grade Uruaçu Meteorites! 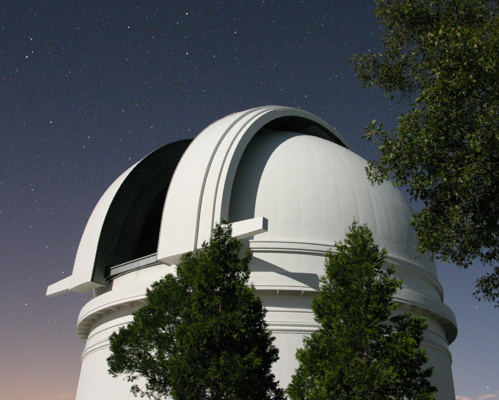 Congratulations to the Santa Barbara Astronomical Unit (SBAU)! 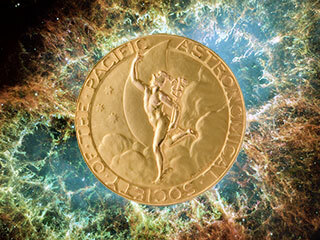 Celebrate Global Astronomy Month this April with Astronomy Heroes! Night Sky Network Clubs are Awaiting You! 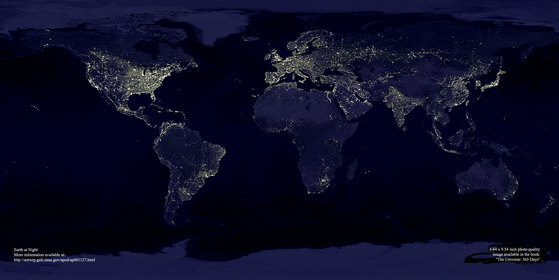 Turn Down the Light, Turn Up the Night, International Dark Sky Week is April 1-8, 2011! Start small, by using the right light fixtures at home and in the neighborhood. 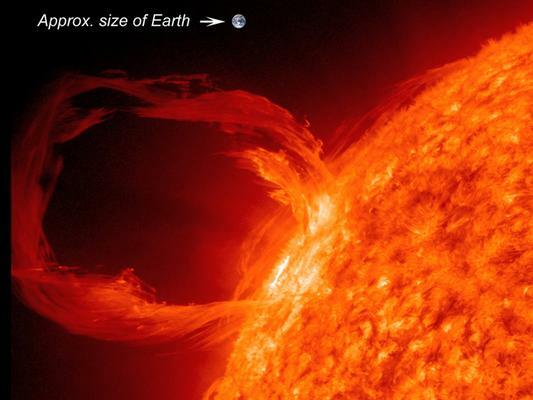 Celebrate the Sun-Earth Day and the Equinox with NASA! Was your club a winner? You still can be! Here are the results of the First Round of 2011 GLOBE at Night Kits & Sky Quality Meters (SQM) Drawing. Star Light, Star Bright, Can You See the Stars Tonight? 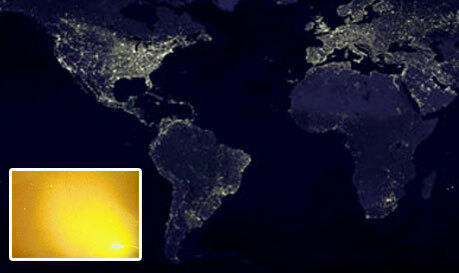 All of us worldwide are concerned about the effects of light pollution. 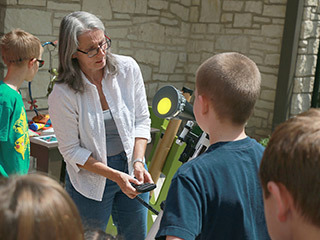 Dr. Connie Walker told us how we could be involved with saving and preserving the night sky. The telecon was held on Thursday, January 20th. 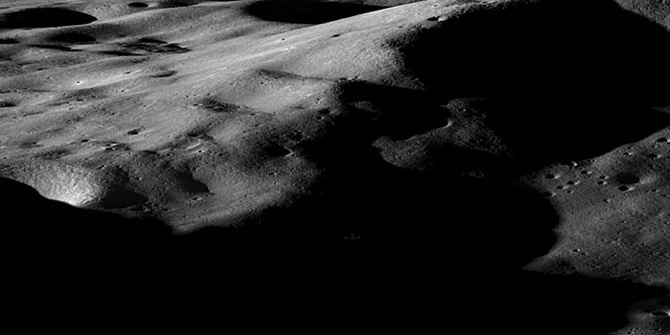 Jet Propulsion Laboratory Wants Your Seasonal Photos! 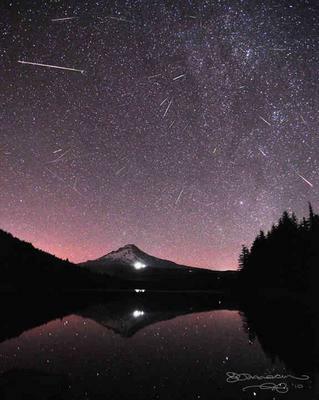 Geminid Meteor Shower, You Are Amazing! 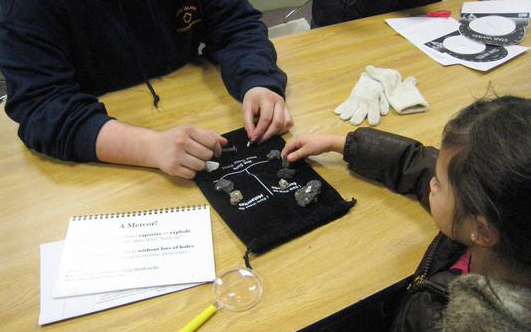 We held our kickoff of our Space Rocks ToolKit with our Teleconference by Dr. Alan Harris, was held Thursday, November 18th. 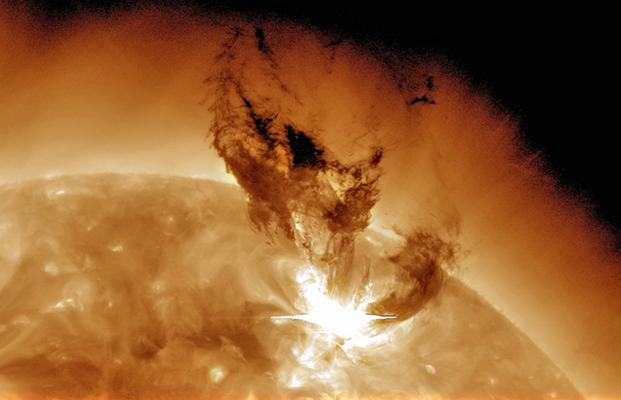 We heard all about Cosmic Disasters, Real and Imagined. Join the Great World Wide Star Count Oct. 29-Nov. 12, 2010! Join the Great World Wide Star Count Oct. 29-Nov. 2010! 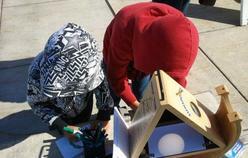 Budding astronomers learn why the moon appears to change shape. 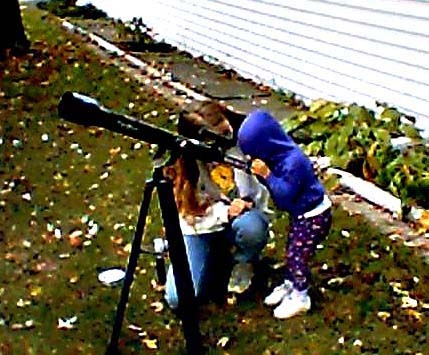 What will YOU discover with your local astronomy club this fall? Everyone's lining up for Fall Astronomy Day! 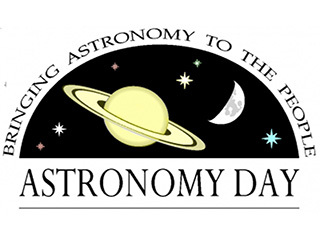 Saturday, October 16th is Fall Astronomy Day. 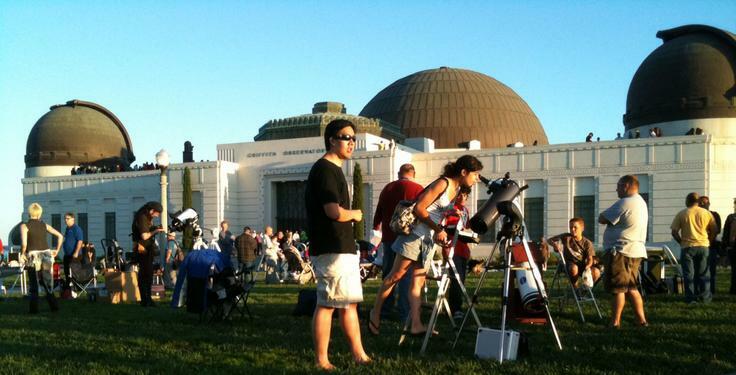 Find out where you can see the Sun or go stargazing with astronomy clubs around the country. 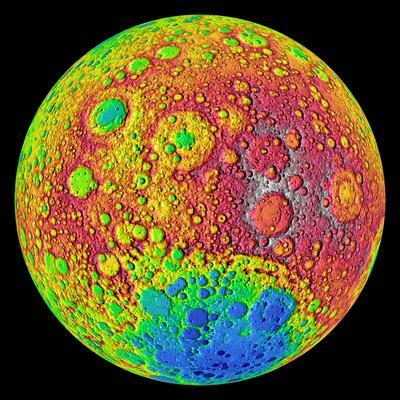 Almost 100 Events for International Observe the Moon Night! 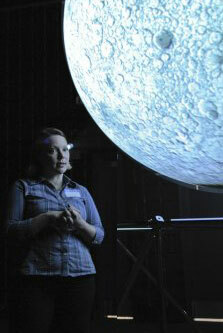 It's Never Too Late to Learn About the Moon - Contact An Astronomy Club! 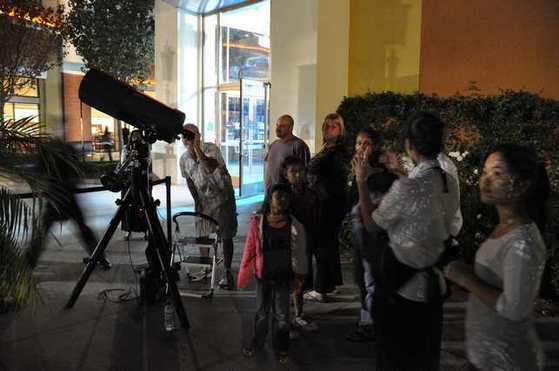 Celebrate International Observe the Moon Night with a Night Sky Network Club on Saturday, September 18, 2010! 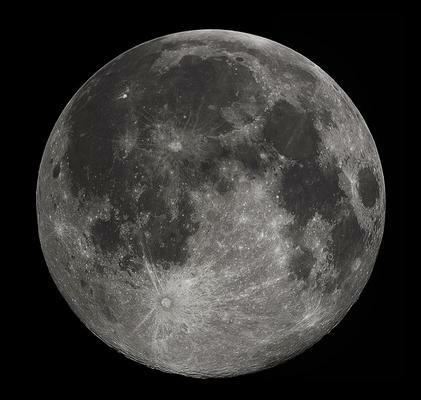 On Saturday, September 18, 2010, Observe the Moon with the World! Will Mars Look as Big as the Full Moon on Aug 27, 2010? No, impossible! Contact Your Local Astronomy Club & See the Planets as You've Never Seen Them! 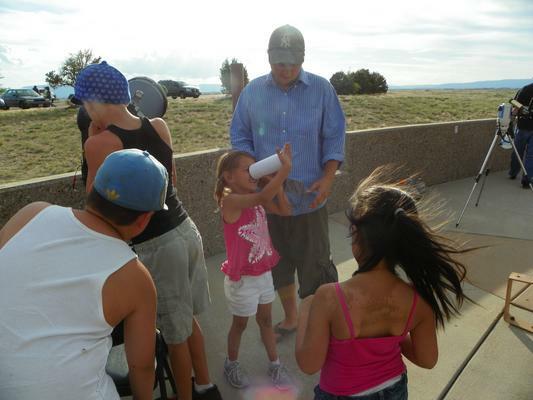 Find family astronomy events that are (mostly) free for your kids using the free iPhone App: Go StarGaze! Free Go StarGaze iPhone App! 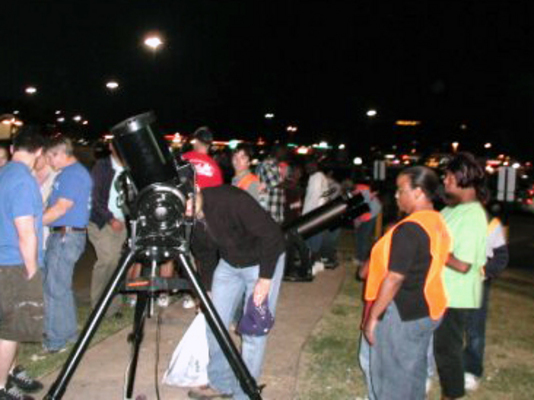 Find astronomy events & clubs all over the USA! 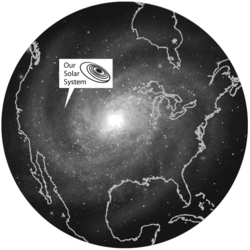 You can see the area of the sky where NASA's Kepler Mission is searching for planets like the one we live on. 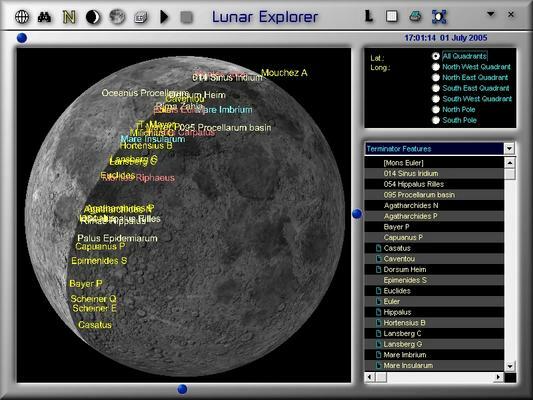 Join the craze to explore the moon from your computer! Get involved with the universe at an early age. In less than 2 minutes you'll understand more about the difference between these three! The clear skies and warmer weather of spring usher in the stargazing season. Find astronomy events near you and celebrate with the amazing astronomy clubs in the NASA Night Sky Network. 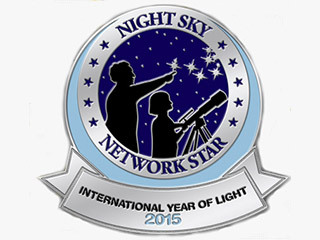 Celebrate Astronomy every day with award-winning Night Sky Network club members. 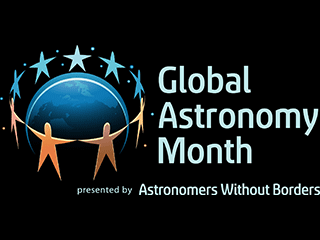 Celebrate Global Astronomy Month with the World! 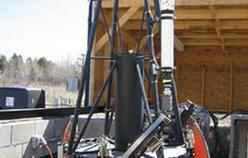 And telescopes are coming out of the garages and into the parks and schoolyards. 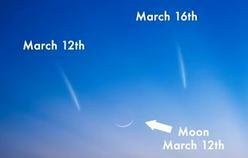 Click here to take a look at astronomy events across the country in early Spring. What's happening in your neighborhood? Look up at night! Can YOU see the stars? 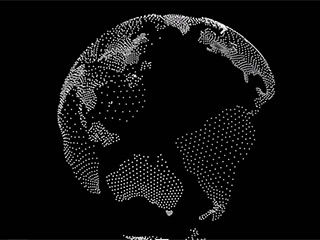 The GLOBE at Night Campaign is now on! 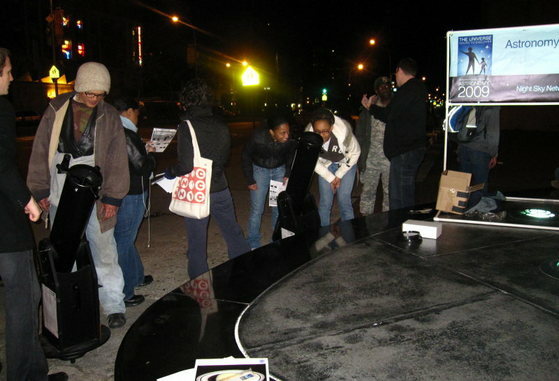 This annual 2-week campaign helps address light pollution locally as well as globally. 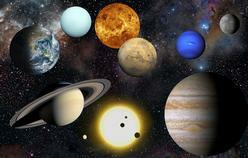 Our Sun and planets make up the Solar System. 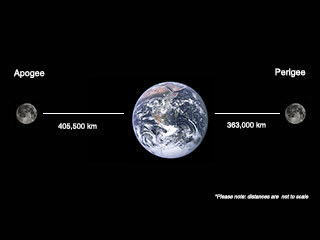 If we shrink the Sun to be one meter (39 inches) in diameter, how big would the planets be? Find out by attending events with your local astronomy club. With the grip of winter upon us and still holding tight, we all want a glimpse of the Sun. 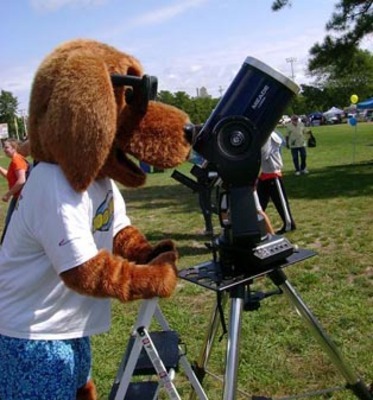 Safely observe the Sun with your local astronomy club. 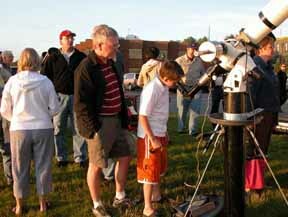 Find astronomy events in your community. "Wonderful! Navigation is simple, the wealth of information is fantastic!" Announcing New and Expanded Night Sky Network Website Coming December 1st! If you like the NASA Night Sky Network now, just wait 'til you see what you can do starting December 1st. New improved Website Coming Soon! As part of the International Year of Astronomy (IYA) 2009, the Night Sky Network will be adding some new and exciting features to our website to help you find what you want when you want it. That's this months International Year of Astronomy Theme. Find out how you can learn more about the Universe, our Milky Way and the Andromeda Galaxy with your local Night Sky Network astronomy club. Do you ever ponder that question? Over summer vacation did you travel to some new and exciting places? Even if you didn't you can with the aid of the Night Sky Network. 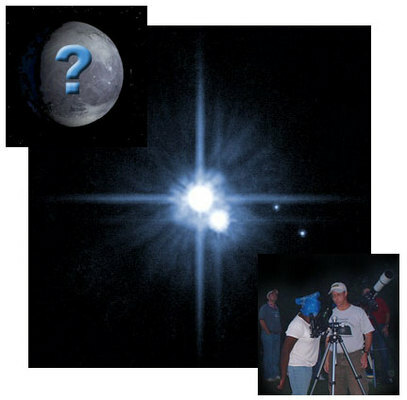 Here are a few examples of how these skilled amateur astronomers can help. 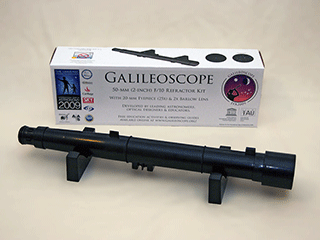 To show our appreciation to Night Sky Network clubs, for your fantastic outreach efforts and to recognize your dedication to your community during this third quarter of 2009, our Quarterly Prize were six Galileoscopes to each of five qualifying clubs. See who won! These are the highlights in the night sky your local astronomy club would love to tell and show you about. For the month of September, the Night Sky Network is focusing on Planets and Moons. You can see Jupiter and our Moon tonight. 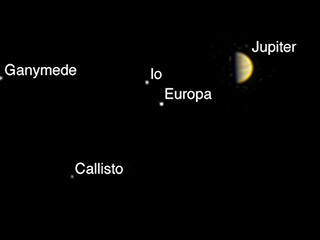 Over 400 years ago Galileo gazed in wonderment at Jupiter and its moons. 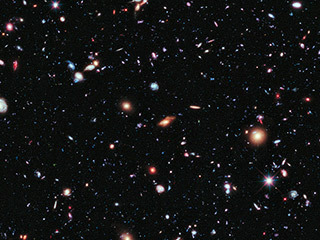 Explore the heavens as Galileo did and share the excitement. Here's a few examples of how we're doing it. 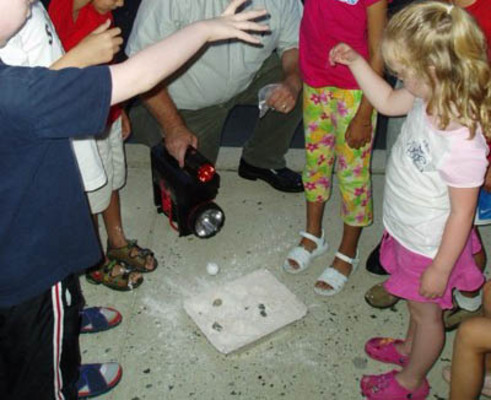 Cooking up a comet is a fun experience and an excellent way to learn about rocks and ice in our Solar System, especially if you mix in enthusiastic amateur astronomers from the Night Sky Network and a bunch of kids. The summer season is upon us, and with that are fun events, both indoors and out. Let's see what Night Sky Network Clubs are up to and catch the excitement. What is a black hole? A black hole is a region of space that has so much mass concentrated in it that there is no way for a nearby object to escape its gravitational pull. Do you have misgivings about getting sucked up by a black hole? Fear not. 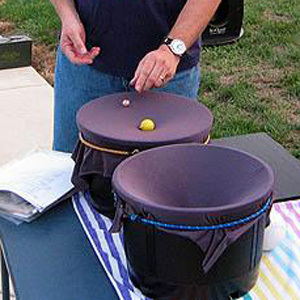 Your local Night Sky Network astronomy club can help explain the mysteries of these curious objects. 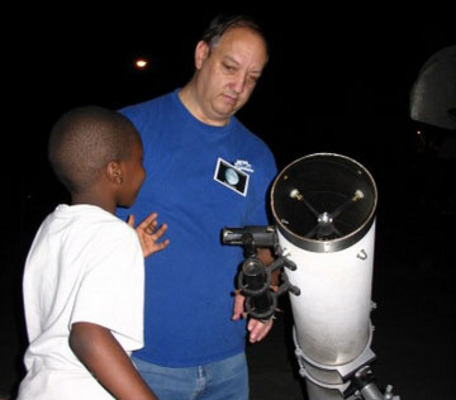 Whether it's inspiring students, having a safe place to hang out or seeing cool stuff in the night sky like exploding stars, your local amateur astronomers will show and tell you all about it. 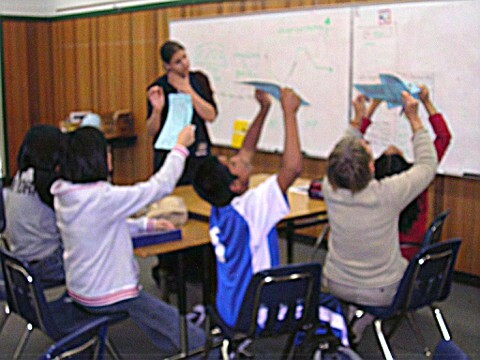 Hands-on participation can't be beat! One of the great attractors to the night sky are star clusters. Look up in a dark sky and you will see from a few to a few thousand stars. Some of these stars, like our Sun, are loners as they move around the galaxy. Others reside in clusters, and these clusters can be some of the most beautiful sights visible in a backyard telescope. Find out why over 1,000,000 pairs of eyes are enjoying the day and night sky, and keep coming back for more! Have you looked into the eyepiece of a telescope and seen the wonders of the Universe? 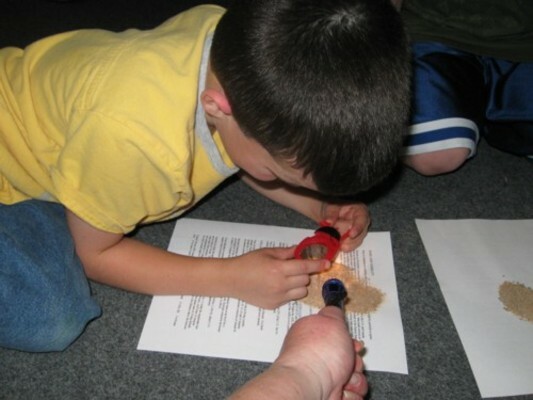 Or have you ever taken apart a telescope to see how it works? If not, here's your chance! 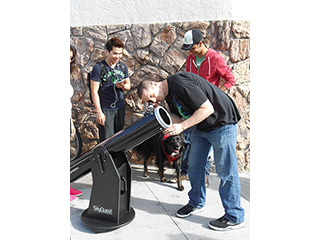 Coming to a Sidewalk Near You: A Telescope! Have you looked into the eyepiece of a telescope and seen the wonders of the Universe? If not, here's your chance! Between Thursday, April 2nd and Sunday, April 5th you can have this fabulous opportunity. 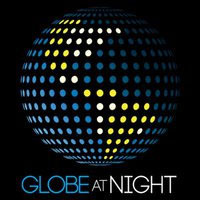 GLOBE at Night is happening March 16-28th! What are your plans? No matter what the weather, day or night, amateur astronomers from the Night Sky Network are always happy to show you the wonders of the Universe. Have you ever looked through a telescope? Now's the time! 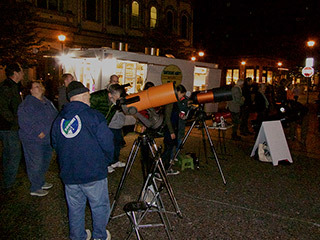 Join our celebration of the International Year of Astronomy (IYA 2009) with your local amateur astronomy club and enjoy the wonders of the day and night sky. Not only can you look into the night sky, but by using a safe solar telescope you can view our nearest star, the Sun during the day. 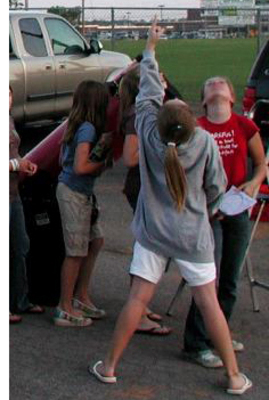 Check out our International Year of Astronomy February Feature and see what these Girl Scouts are so excited about. Are You Ready to Observe? You may have heard by now of IYA 2009. Well, if not here goes. In this year of 2009, the world will celebrate the International Year of Astronomy (IYA) as it commemorates the 400th anniversary of Galileo's use of a telescope to study the skies. Over 140 countries are participating. In the US, here's how we're getting involved. 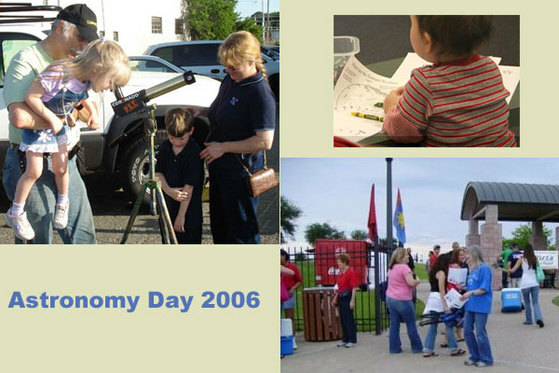 The International Year of Astronomy 2009. What does it mean to you? 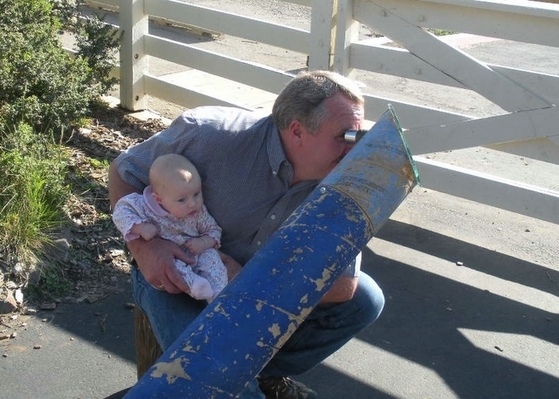 Why are these folks looking in this telescope? They are experiencing discovery. Come join the fun. Look at the Moon, Jupiter and Venus. 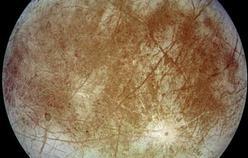 See what Galileo saw 400 years ago. What's that bright star you see in the western evening twilight? And what about the other one? Well, they're both planets and not stars after all. Find out more about these heavenly bodies with your local Night Sky Network amateur astronomy club. 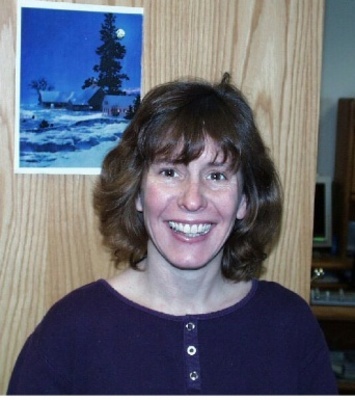 The Green Bank NRAO Telescope and the Astronomical Society of the Pacific invite you to attend a telecon for fun to share information about building a "sidewalk ready" radio telescope, with speaker Sue Ann Heatherly. We hope you find this telecon refreshing and pique your interest in another avenue of observing the Universe. Would you like to send your name into space? Would you like to send your name into space? 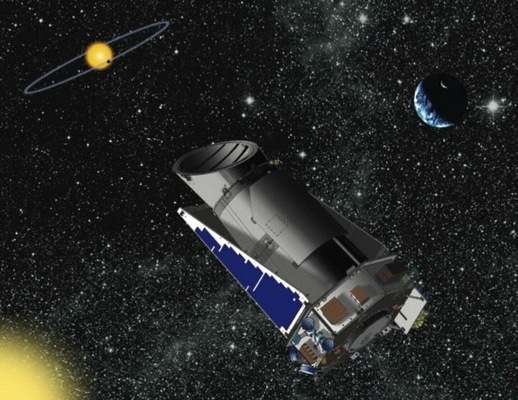 You can, on the Kepler Mission spacecraft, until Thanksgiving on November 27th. Watch The Journey to Palomar, airing on most PBS stations. 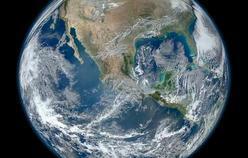 It has been said that George Ellery Hale did for the entire universe what Christopher Columbus did only for the Earth. Most people have never heard of Hale, but his life and work had a profound effect on the development of 20th century science in America, most notably astronomy. Watch The Journey to Palomar, airing soon on most PBS stations. Over eight hundred thousand people seem to think so! 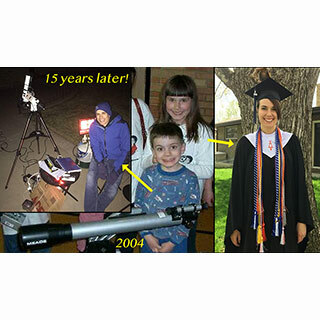 Since inception of the Night Sky Network, member amateur astronomy clubs from all over the United States have enthusiastically supported outreach. Find out what a sample of clubs are doing across the country. Finding the wonders of the day and night sky is fun, even for curious bears. 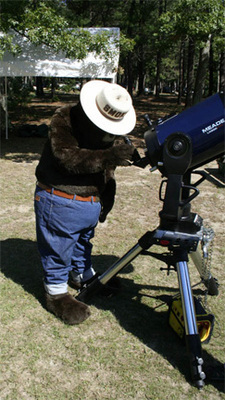 Check out what has Smokey so interested in astronomy. 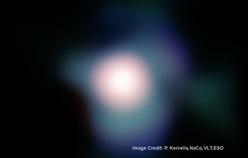 In commemoration of the Hubble Space Telescope (HST) completing its 100,000th orbit around the Earth, scientists have aimed Hubble to take a snapshot of a dazzling birthplace of stars. Umbra ... Penumbra. What's It to You? 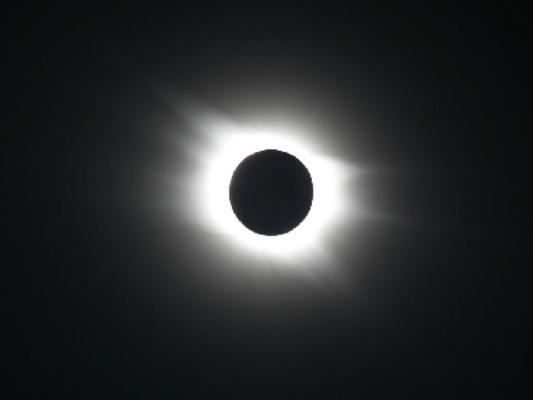 What is the big deal about a Total Solar Eclipse? Plenty. A total solar eclipse is probably the most spectacular astronomical event that most people will experience in their lives. Many thousands of amateur and professional astronomers travel worldwide to observe and photograph them, but there is plenty to learn and observe right here. On a warm summer night have you ever looked up in a nice dark sky and saw a streak of bright yellow orange and wonder what it was? Well if not, you should this year. Chances are it was from a meteor shower. 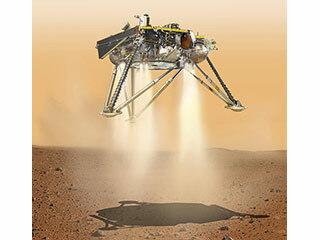 The Phoenix Lander has arrived on Mars and amateur astronomy clubs are getting the word out about what it is digging up. Over 700,000 have been served..not hamburgers, but people, by members of the Night Sky Network. 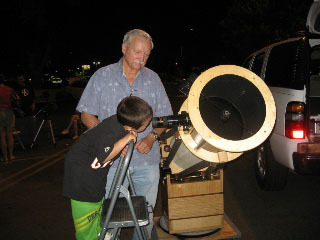 Check out the big events the Night Sky Network affiliated amateur astronomer clubs around the United States have made. These clubs making a huge impact to bring you a better understanding of astronomy and the science and inspiration of NASA's exciting missions. 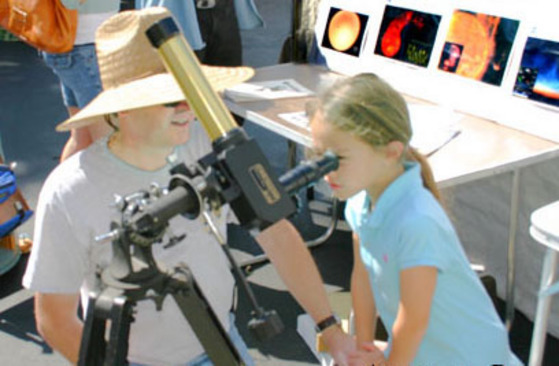 Astronomy Day 2008 is right around the corner. 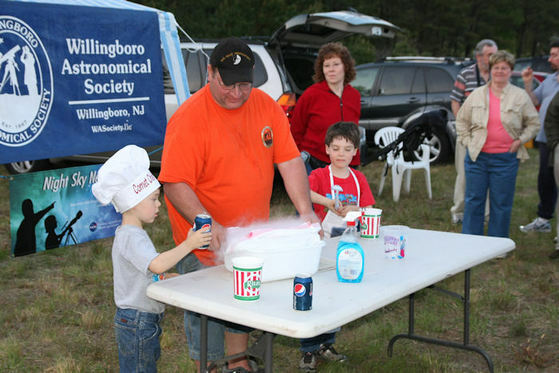 On May 10th, astronomy clubs around the country will be celebrating with their communities. 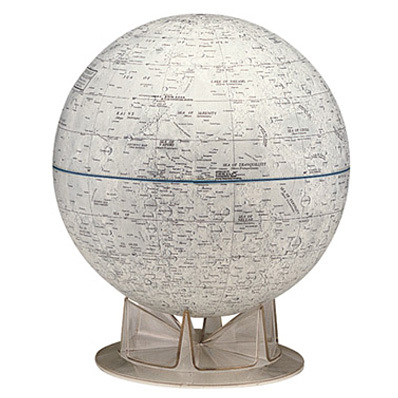 Many bring out their telescopes, others make scale models of the Solar System or of the Universe. And a surprising number let the kids have all of the fun showing off what they know about the wonders of astronomy. 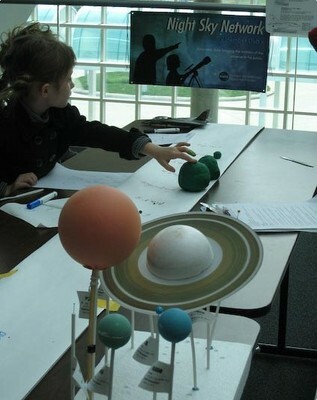 Hear how young people made last year's Astronomy Day a success. There is nothing like looking at Saturn through a telescope for the first time. It has stirred the emotions of many novices and even turned some of them into amateur and professional astronomers. 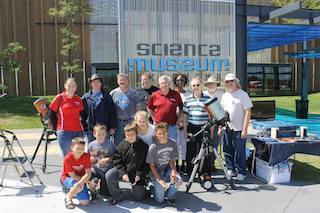 Hear what these astronomy clubs have to say about showing Saturn to some astounded groups. 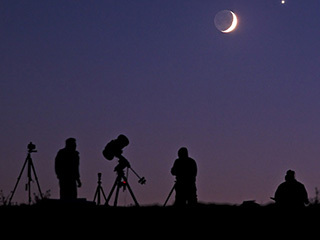 If you have an interest in astronomy, want to know more about the night sky, or are thinking of buying a telescope, then an astronomy club should be your first stop. 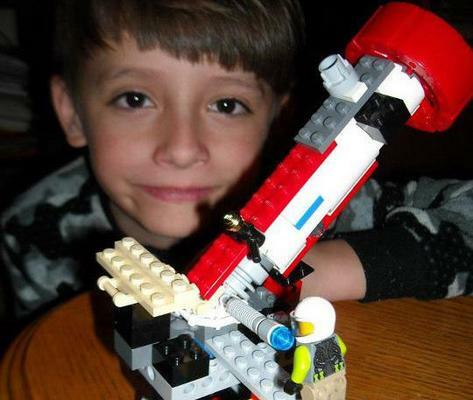 Across the country, amateur astronomers are helping more and more people become star struck and learn about what's up. 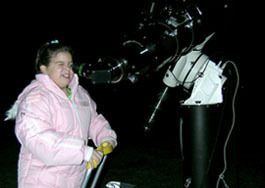 Join thousands of other students, families and citizen-scientists hunting for stars from February 25 through March 8. 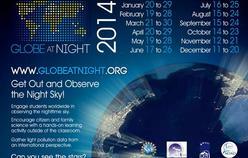 Take part in this international event called GLOBE at Night to observe the nighttime sky and learn more about light pollution around the world. 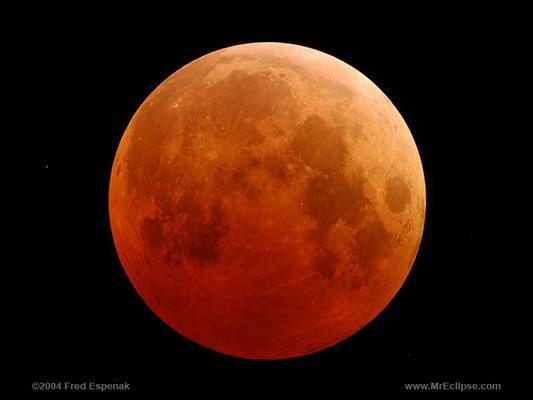 On Wednesday, February 20th, there will be a fantastic opportunity for anyone in the continental United States to view a lunar eclipse early in the evening. With clear skies and just your eyes, you will be able to witness this astronomical beauty from your backyard. But hear how these astronomy clubs take it farther. Have you ever wondered why amateur astronomers spend all those late nights outside, even in the cold, just watching the heavens? 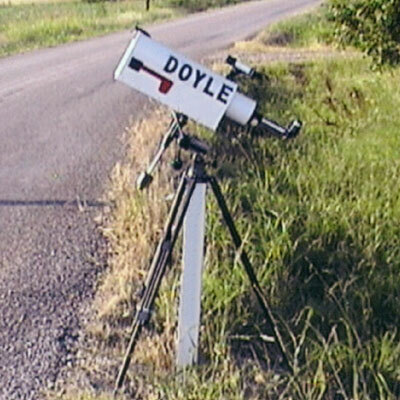 Well, these astronomers are sharing a bit of the enjoyment they find in the hobby with their communities. But don't take our word for it. Hear what people are saying about these local heroes. 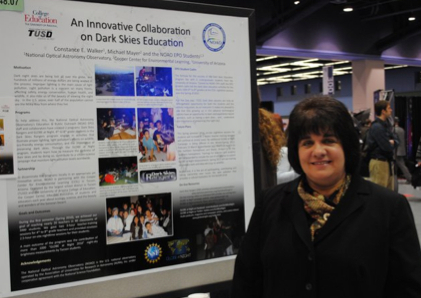 Astronomy clubs across the country are getting the word out about a precious resource that most people don't notice we are losing- our dark skies. When was the last time you saw the splendor of the Milky Way? These clubs are helping their communities save energy and in the process saving the nighttime for stars. Stargazing is usually at the mercy of the weather, making clear nights a luxury for astronomers. But when it is not clear, there is still a lot of astronomy to be done. 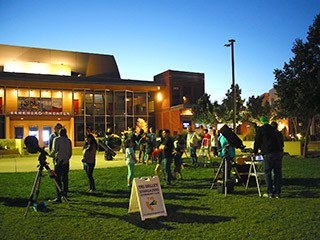 These clubs have learned how to make the best out of cloudy nights and still treat their visitors to an evening of astronomy fun. The Night Sky Network has just passed the 600,000 people mark thanks to astronomers all over the country dedicated to sharing their love of the night sky with their communities. 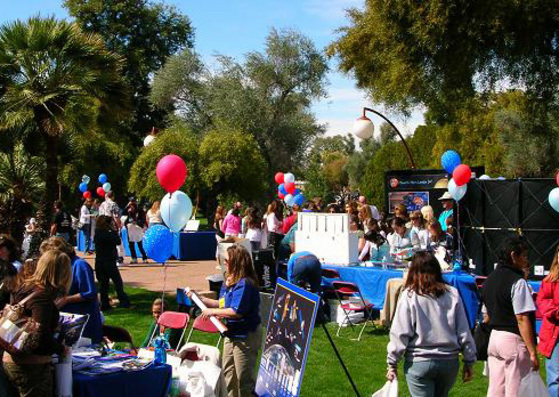 Some of the biggest audiences come from partnerships that astronomy clubs have with other organizations. 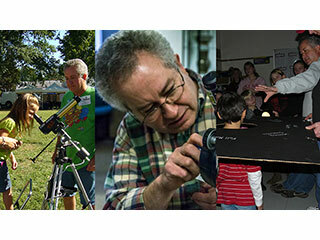 Hear about some of the places where these stellar educators have been bringing their telescopes and fun demonstrations. 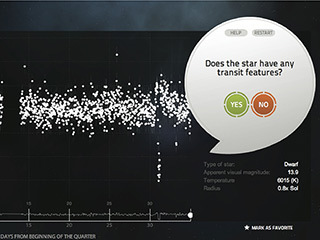 This trick questions is one of astronomers' favorite ways of reminding people that we have our very own star- the Sun- right here in the Solar System. Astronomy clubs don't just bring their telescopes out at nighttime. 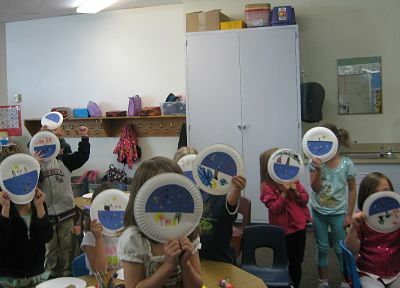 With special filters and fun activities, these amateur astronomers are teaching us about our nearest stellar neighbor. Astronomy can be such an inspiring pastime. Contemplating the vast distances, sizes and sheer number of objects in space can open minds and inspire creativity. These astronomy clubs are bringing creativity into their presentations and extending their reach with fun activities for everyone. 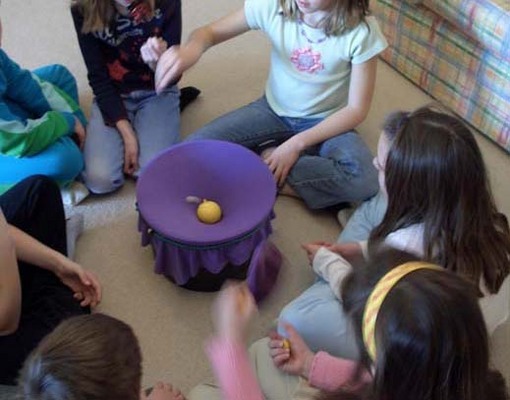 Resources Help Clubs Reach Out, and In! 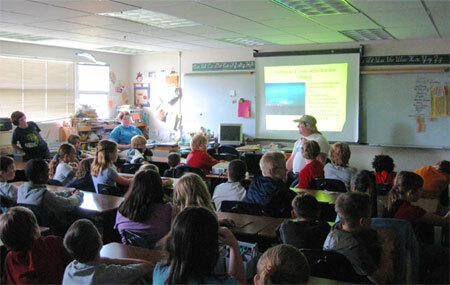 Astronomy clubs across the country are using Night Sky Network resources to help them demonstrate big ideas to everyone. Our members have the passion and the knowledge to get people excited and Night Sky Network gives them the tools to bring the heavens right down to earth. 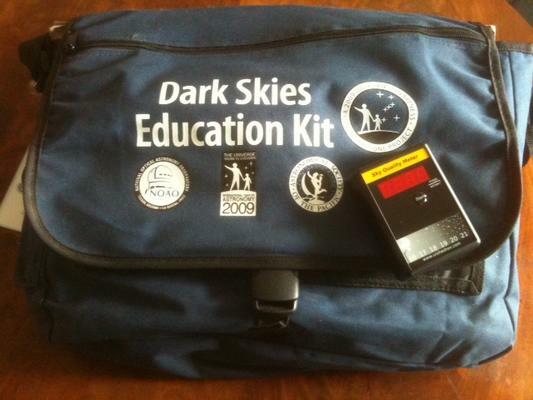 Read what happens when the astronomers get these ToolKits. 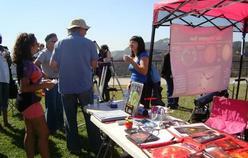 Astronomy clubs take the time to explain some fun lunar facts to the public with interactive astronomy tools. Hear how they have sparked the imaginations of all ages by sharing the secrets of our closest celestial neighbor. Over Half a Million People Reached! 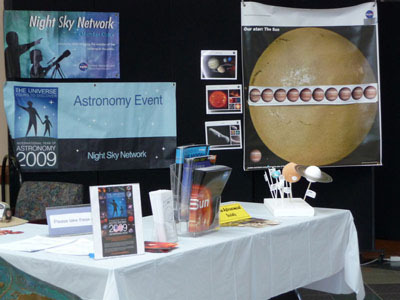 Thanks to some excellent summer events, Night Sky Network member clubs have now reached over 500,000 people (and counting) with their astronomy enthusiasm. 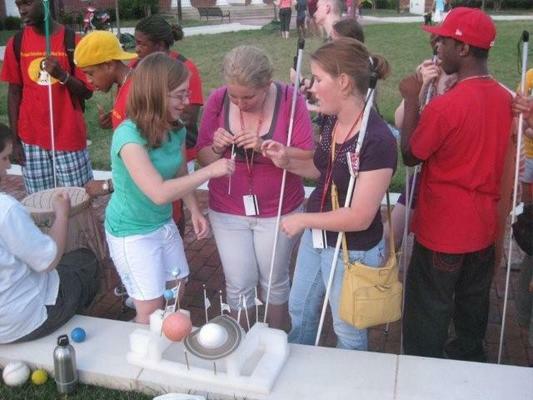 Hear what these clubs have been doing to share their love of astronomy with young people this summer. Did you know that over 40 NASA missions have included an astronaut who was once a Girl Scout? But before these women ever started flight simulation, there was someone who sparked their imaginations. When it comes to inspiring today's girls with wonders of the night sky, there's nothing like an astronomy club to really bring it home. 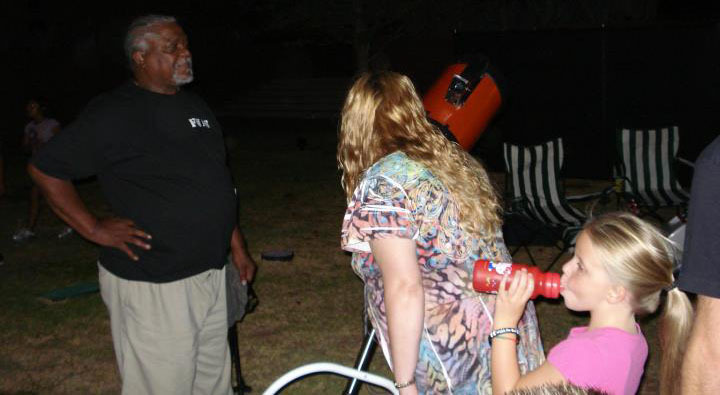 Young people around the country are busy sharing their love of astronomy with their families and communities. 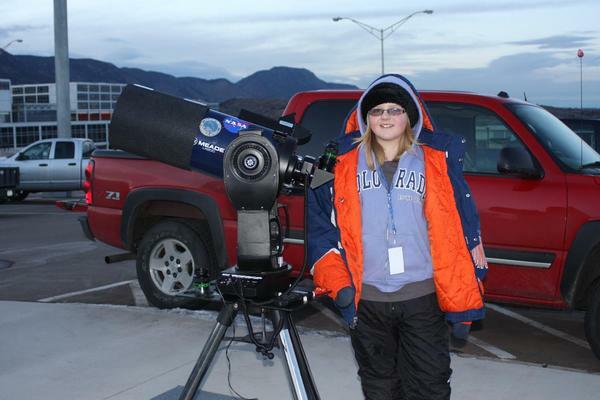 Astronomy clubs are inspiring the next generation, who in turn are spreading the word from star parties and school open houses. Hear how these youngsters are taking what they learn and sharing it across generations, abilities and cultures. Look at all those people with their eyes to the eyepieces. Just what is everyone so exited about? 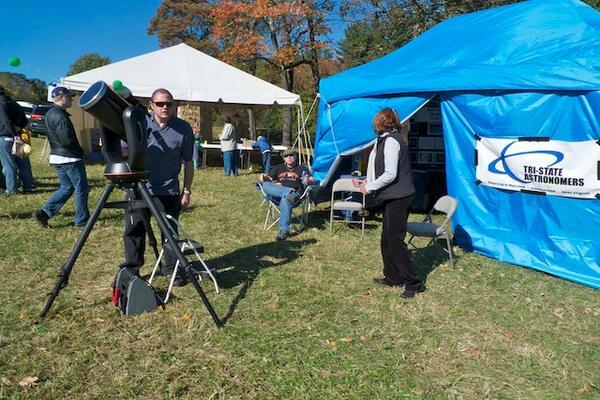 Find out the reactions these astronomy clubs are getting while sharing telescopes with their communities. 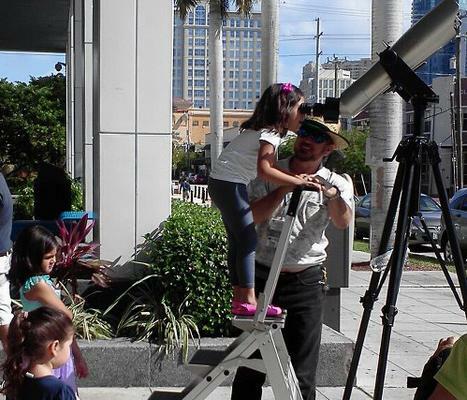 Astronomy clubs across the country are showing off the splendors of daytime observing. 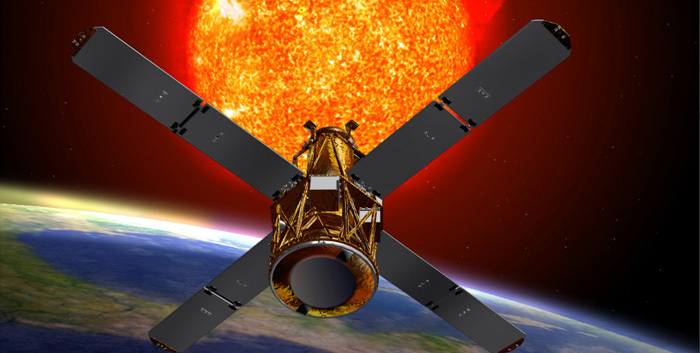 Find out how to safely observe the Sun and more with your local experts. Never observe the Sun directly. 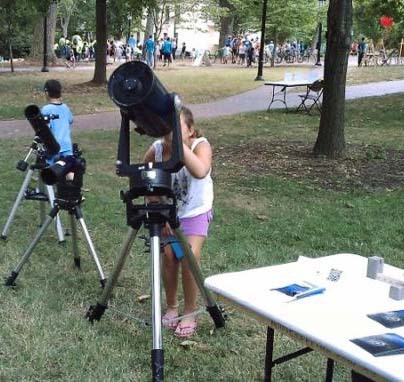 Hear about some of the creative ways clubs across the country celebrated our favorite holiday- Astronomy Day. 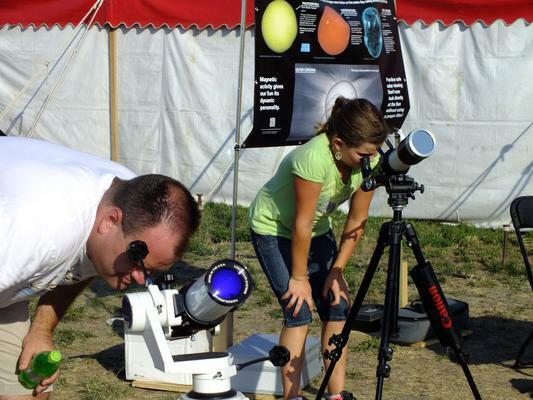 From parades to telescopes, these active clubs are busy getting the word out that astronomy is a stellar pastime. Black holes have all the mystery of good science fiction and yet they are real astronomical objects. 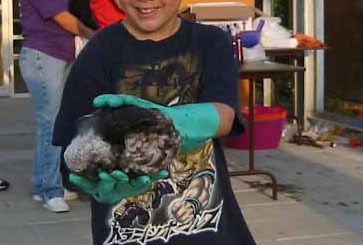 Kids (of all ages) want to know what they are, what would happen if you fell in, and how you find something you can't see. 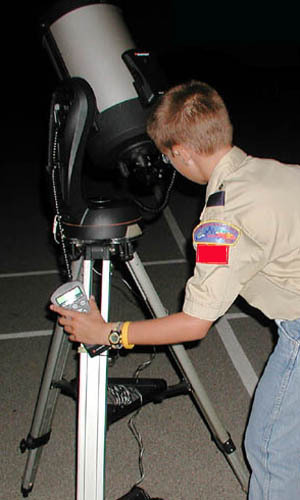 Astronomy clubs across the country are prepared with Night Sky Network materials to tackle even these strange dark objects. 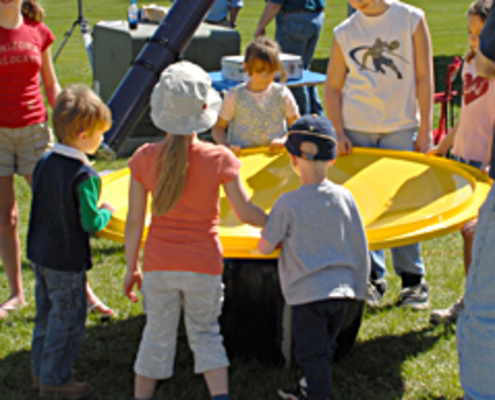 Astronomy Day is coming up April 21st! 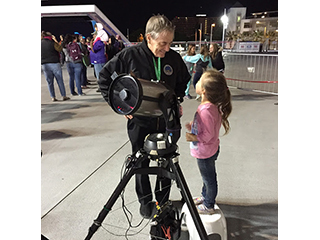 From planetarium shows to star parties, Night Sky Network clubs shared their passion for astronomy with over 7000 people last month alone. Hear about some of the biggest events that have happened lately and find out what is going on in your area this Astronomy Day. You may find them at night on a sidewalk or in an open field, looking up in wonder, or even with telescopes. These people are not necessarily crazy. They may be astronomers! 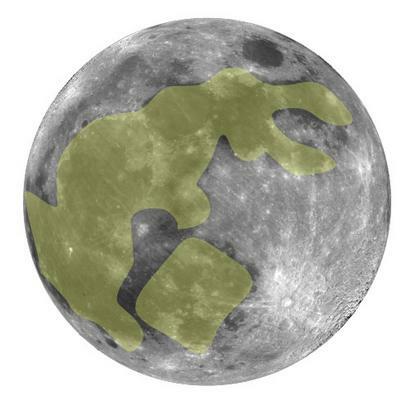 The Moon is the source of both beautiful folklore and current misconceptions. 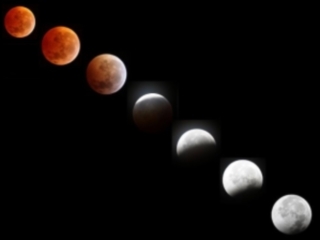 Do you know why the Moon has phases? 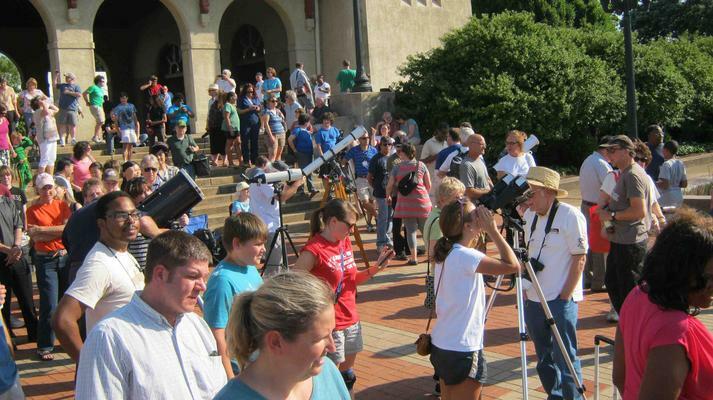 Find out how local astronomy clubs are telling the story of our closest celestial neighbor. Sometimes the weather at star parties can be less than ideal. 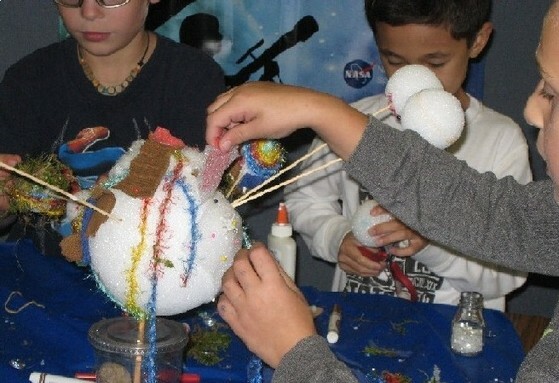 Astronomy clubs are turning clouds into rainbows by using Night Sky Network activities when a star party gets rained out. 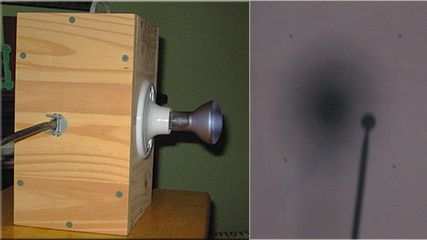 Using simple models and interactive demonstrations astronomy comes alive, even inside. Then what you see in the eyepiece when the weather clears means so much more. 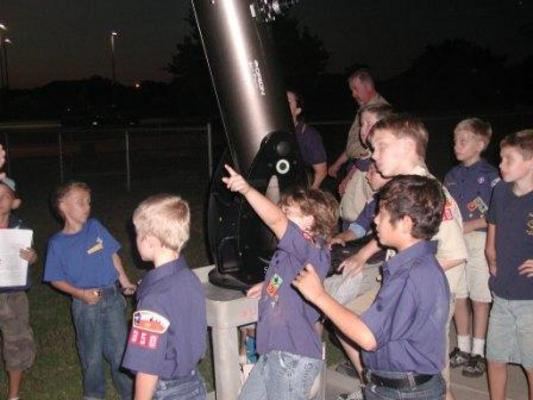 Find out how astronomy clubs across the country are helping Scouts learn about the wonders of the night sky. 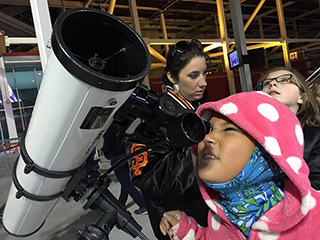 Whether they are finding their way around constellations or learning about planets, the support of these astronomy clubs is an astronomical resource. 5,000 Events and Going Strong! 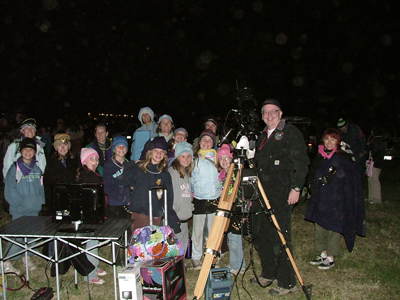 The first month of 2007 marks a huge accomplishment for the Night Sky Network's dedicated astronomy clubs. Together, we have held over 5,000 events since Night Sky Network began! 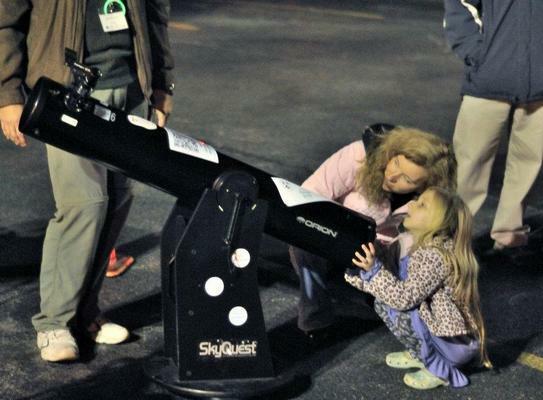 Whether at star parties, in parking lots, or with school groups, these astronomers have shared the excitement of the sky, reaching more than 400,000 people across the country. 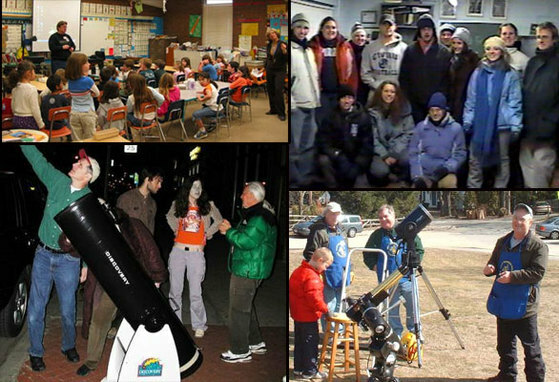 Many members of astronomy clubs across the country bring their knowledge and love of the skies into the schools to share with the next generation. 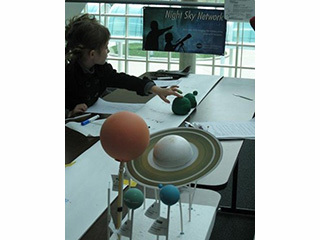 Night Sky Network materials can be easily adapted to fun classroom activities that encourage active questioning and learning. 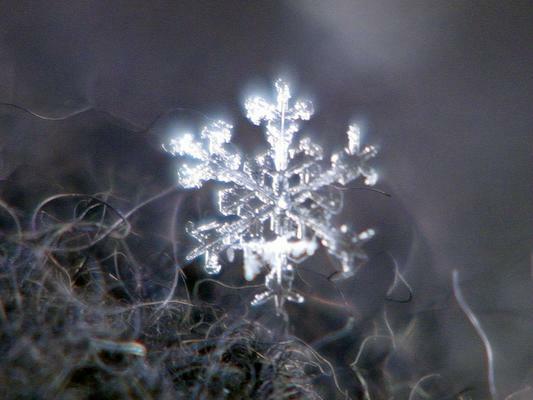 What if you took a break from the holiday mayhem, stopped for a minute, and simply looked up? You may be surprised to see streaks of light across the night sky as the Geminid meteor shower peaks after midnight of December 13th. 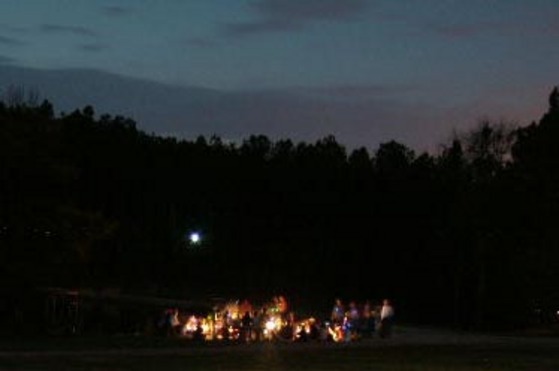 Astronomy clubs across the country will be showcasing this display of lights in the night sky. What a good way to spend quality time with friends or family, possibly learn something new, and make new friends. Find out how. With all of the exciting outreach opportunities recently, this month marks a total of 400,000 people reached by Night Sky Network clubs! This is an exciting milestone for the hundreds of active Night Sky Network astronomy clubs across the United States. Hear about some of the huge events that reached out to local audiences and find out how you too can experience the magic of the night sky. Did you see the Mercury Transit? Astronomy clubs around the country shared the unique sight of little Mercury crossing between the Earth and the Sun. People of all ages and walks of life enjoyed this event. Are You Ready For the Mercury Transit? Astronomy clubs across the country are preparing to showcase the upcoming transit of Mercury on November 8th. 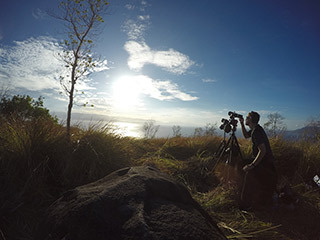 See how they are using special telescopes, fun activities, and lots of enthusiasm to share with you just how dynamic daytime astronomy can be. Just look at how much fun they are having in preparation. 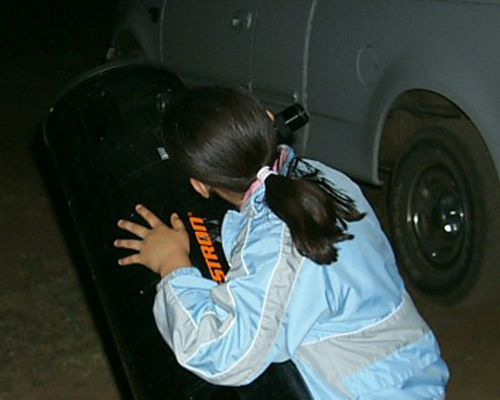 If you have children, star parties are a great way to expose them to the wonders of the Universe. Sometimes it is the kids that make an evening of observing something really special. From off-the-wall questions to the "ah-ha!" 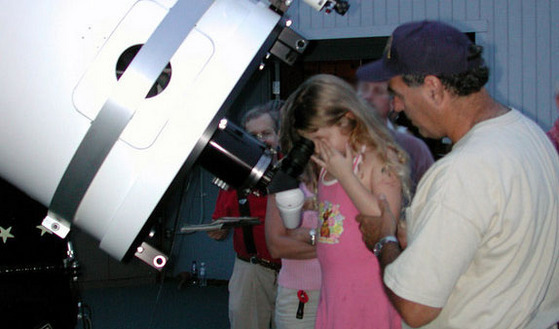 moments, watching young people get excited about astronomy can be very rewarding. 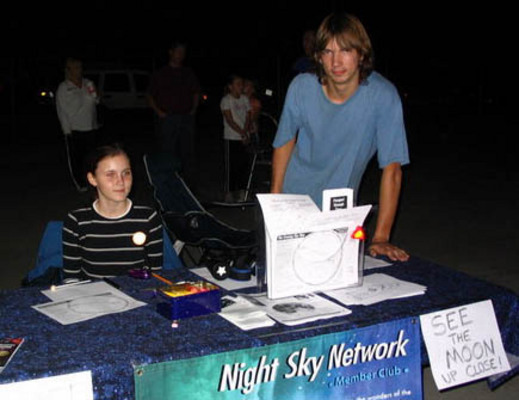 Night Sky Network clubs share some of their recent run-ins with young observers. Night Sky Network astronomy clubs can often be found sharing the night skies in State Parks and National Parks across the country. 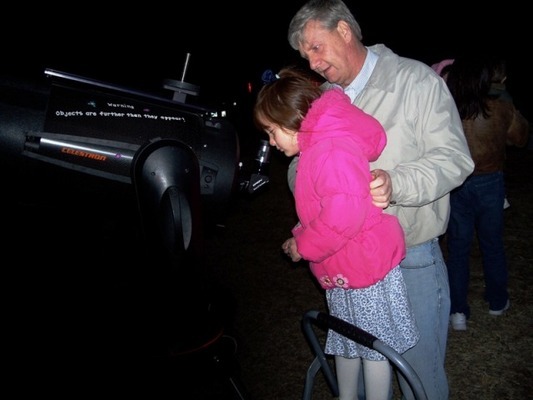 Find out if a park nearby you has a public astronomy program and enjoy looking up under some of the darkest skies around. Night Sky Network takes on Pluto! Pluto's loss of planet status has left the public with many questions and Night Sky Network clubs are stepping forward with answers. It's been a busy summer for the members of the Night Sky Network and we have the numbers to prove it. What is all the excitement about? It's all about astronomy! 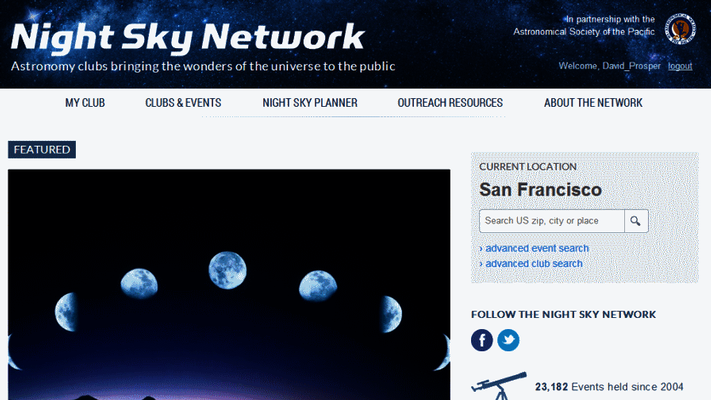 Take a Look at the New Night Sky Network Website! There are lots of new things for you to experience including new resources and a new video. Take some time to explore! In some areas, daytime activities come to a halt in the summer heat but that doesn't mean you have to spend your summer indoors. 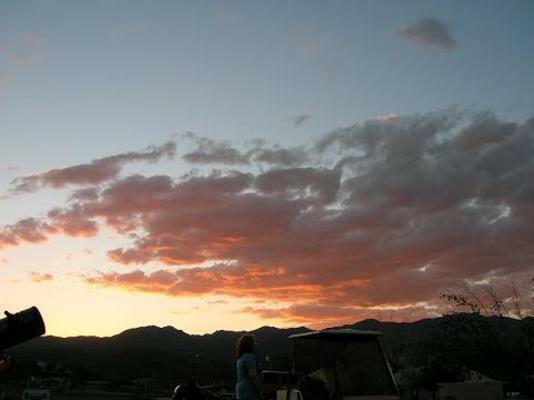 When the sun goes down and the temperatures drop to a comfortable level, an evening spent with a telescope and new friends can be just the thing. Night Sky Network: Over 300,000 served! A little more than two years ago the Night Sky Network embarked on its mission to share the wonders of the Universe with the public. 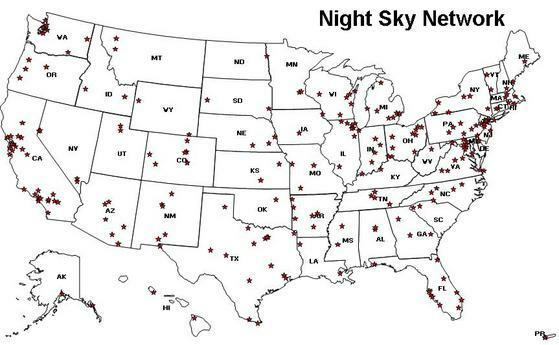 Today the Night Sky Network has grown to include clubs from every state. Miss the big event? There are more on the way! National Dark Sky Week is here! 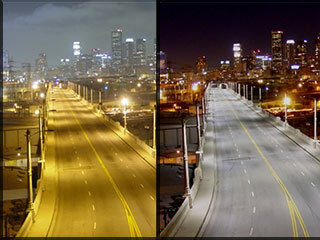 What is light pollution and how does it effect you? Find out all about it! 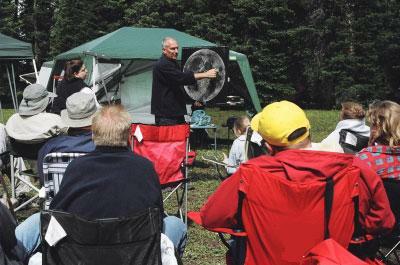 Be it a festival in California with thousands of attendees or a small classroom gathering in Pennsylvania astronomy is everywhere! 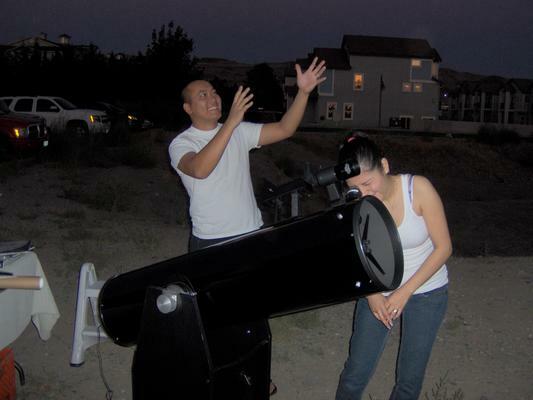 Ask an amateur astronomer why he or she donates their time! Night Sky Network reaches 3,000! 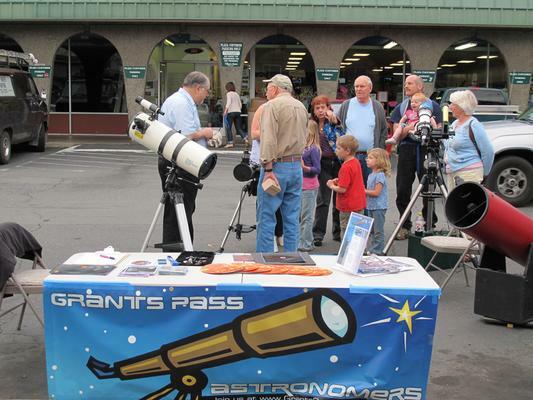 Hundreds of amateur astronomers have logged over three thousand events reaching hundreds of thousands of people! What is it about astronomy that so captures the imagination? 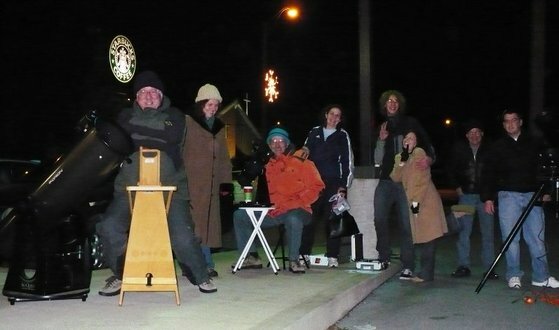 Sidewalk Astronomy: Taking it to the streets. You may have seen them set up at night on the sidewalk but did you dare to take a look? 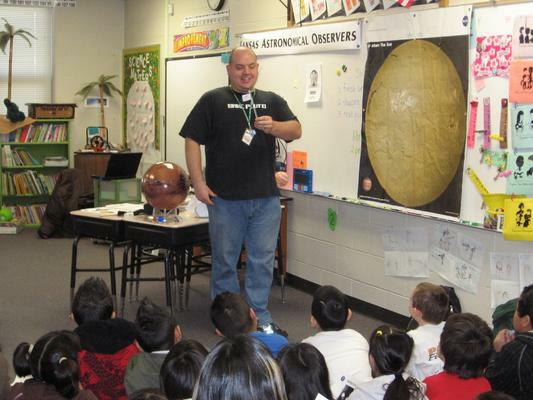 More and more astronomy clubs throughout the United States are providing schools with valuable science education in the form of school outreach. Black Holes: Get Sucked In! Have you ever wondered what would happen if you got sucked in to a black hole? Your local astronomy club and the Night Sky Network can show you! 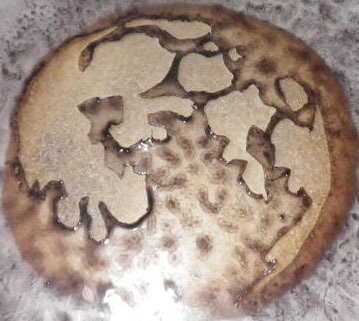 Have you seen Mars in the Night Sky? Take this opportunity to view Mars through telescopes provided by your local Night Sky Network astronomy club! Learn how to use star maps to navigate the night sky! Contact your local Night Sky Network astronomy club to learn how to use star maps to discover the night sky and find stars, other than our Sun, that have planets orbiting them! Physical, age, and life challenges don't limit fascination with the cosmos! 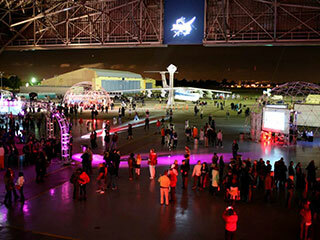 Night Sky Network Exceeds 2,000 Events! UPDATED LIST! 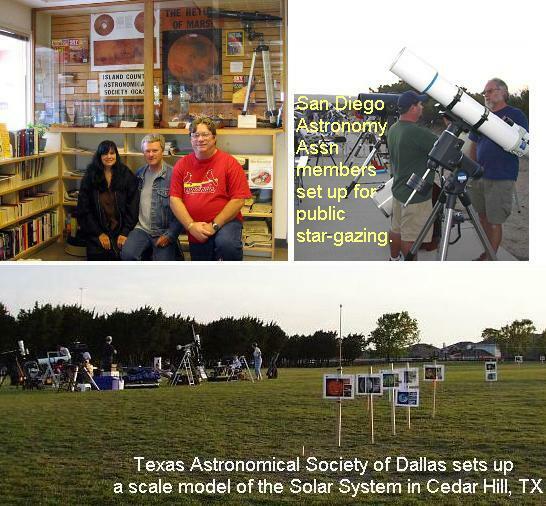 As the NASA Night Sky Network passes the milestone of 2,000 logged events since its inception in March of 2004, we take a look at those astronomy clubs who are the stars! 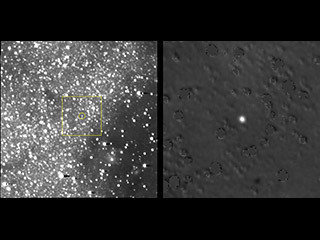 Finding the comet the Deep Impact mission hit is just one of the astounding sights you can experience through Night Sky Network club telescopes. Invite a Night Sky Network Club to your next youth group meeting, community event, or fundraiser and experience the universe . . .
Events held by Night Sky Network clubs can be found almost anywhere! 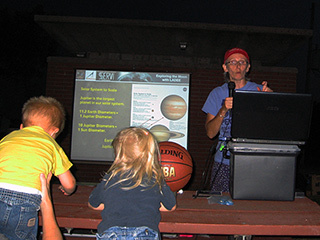 Public outreach doesn't have to be part of a planned event under dark sky conditions. 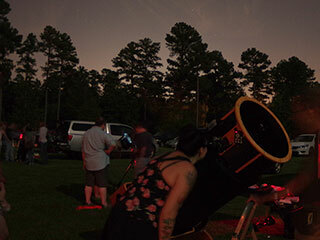 "Spontaneous sessions avoid the frustration of bad weather cancellations," said Dennis Utley with the Brazos Region Astronomy Service Society. Why Put Telescopes in Space? On April 25, the Hubble Space Telescope completed it's 15th trip around the sun in earth orbit. 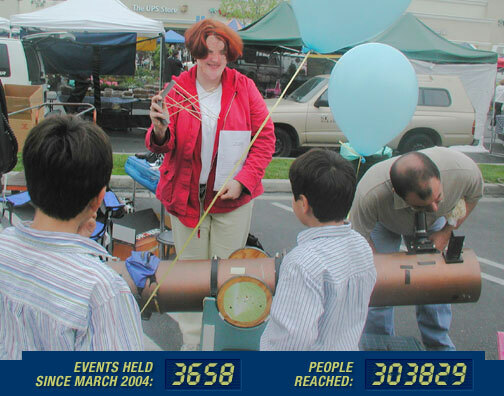 That same day, Night Sky Network clubs around the country celebrated Hubble's 15th anniversary complete with hands-on exercises explaining why NASA puts telescopes in space. 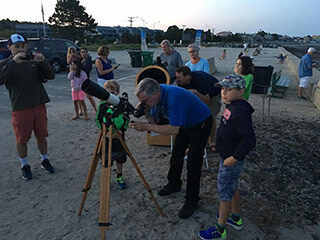 Thousands of people around the country experienced Astronomy Day first hand with the help of the Night Sky Network and as Astronomy Week continues even more are participating. Astronomy Facts: Saturn is known to have more than 100,000 ringlets. The Milky Way galaxy is 100,000 light years across. 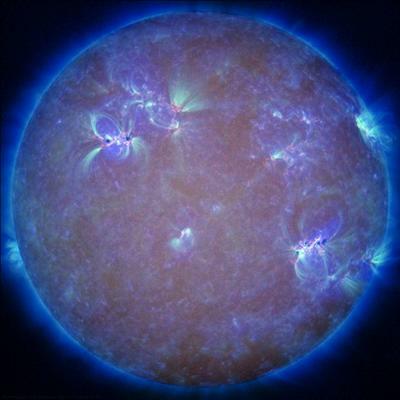 The the temperature of the middle part of the sun's chromosphere is more than 100,000 degrees celsius and the Night Sky Network has now reached more than 100,000 people! What does an aircraft carrier have in common with a bookstore? They are both venues for Night Sky Network clubs to do public outreach. In classrooms around the country, astronomers love asking the trick question: Can you name the nearest star? 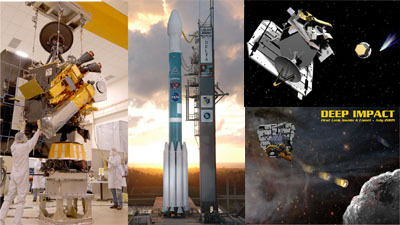 One of the benefits of being a Night Sky Network club is the exciting linkage to active NASA missions and mission scientists. 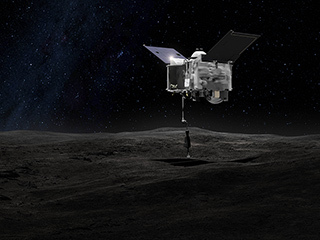 January's teleconference with Dr. Lucy McFadden co-investigator for the Deep Impact mission shared the excitement with the Network a week after the Mission launched. 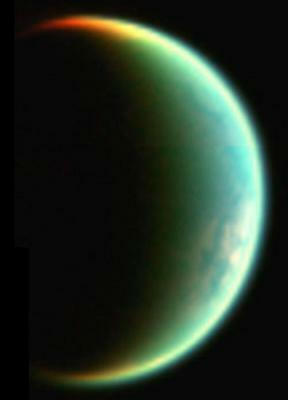 The day after the Huygens probe landed on Titan, the 1000th outreach event was logged on the Night Sky Network. 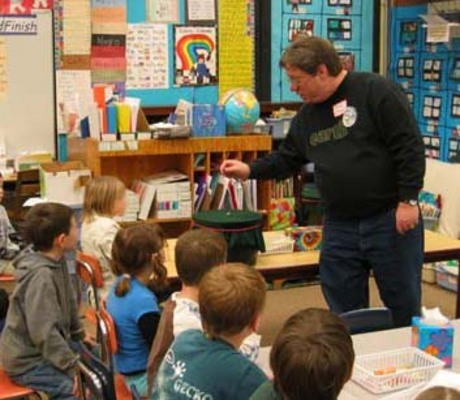 The Susquehanna Valley Amateur Astronomers of Mifflinburg, PA gave a presentation to 100 sixth grade students at Mifflinburg Middle School on January 4th and logged the event the following week. 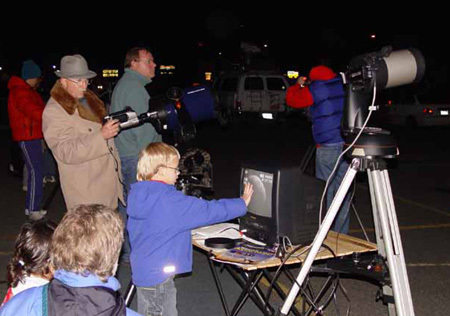 Amateur astronomy clubs join NASA's Night Sky Network because the program rewards them with materials for sharing NASA programs and the science of astronomy with the public. 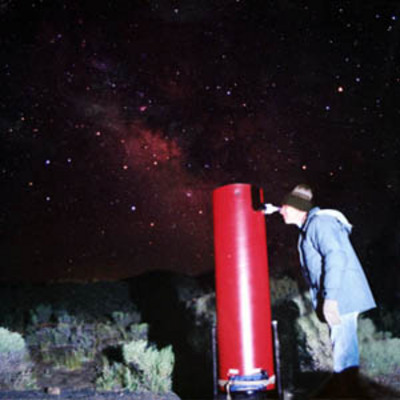 The other part of this partnership, however, are the club volunteers and members themselves who bring their telescopes to public places and share their enthusiasm and interest person-to-person. On an average day in America, two to three Night Sky Network clubs will conduct public events that reach an average audience of 60 people each. When something is happening in the night sky you can trust members of the Network to be out in event greater force. 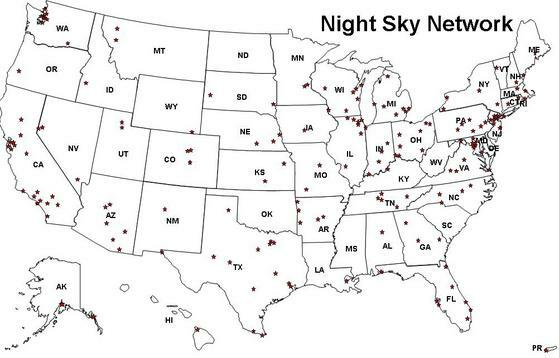 Spanning 50 states and Puerto Rico, the Night Sky Network includes tens of thousands of amateur astronomers as affiliates. 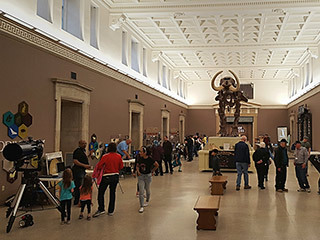 Club members range from newcomers who benefit as recipients of the Network's outreach to experienced amateur veterans engaged in outreach and sharing what they know with others. Part of the fun of amateur astronomy is sharing the wonder of the night sky, but what do you do with a group in daylight, in cloudy weather or both? Our answer is break out the props. Over 600 Astronomy Events Nationwide! 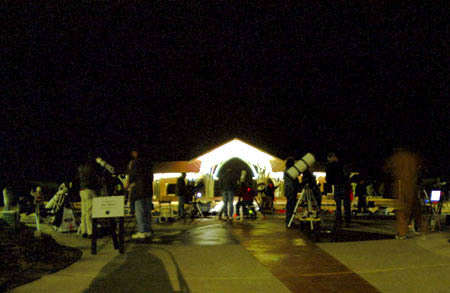 Over 600 astronomy events have been held by clubs using materials provided by the Night Sky Network in quite a variety of settings. 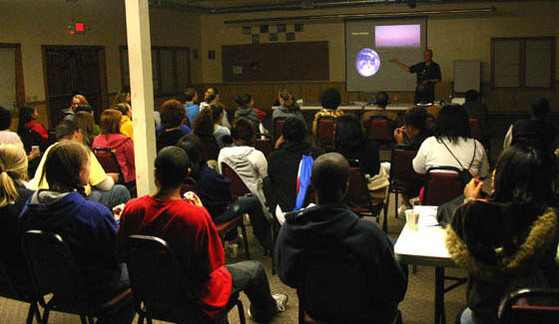 What kinds of events might your local astronomy club offer? Wow! 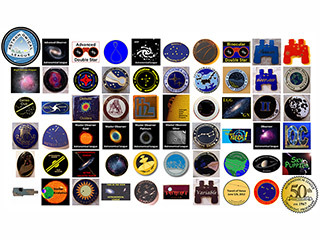 Over 500 astronomy events held using materials provided by the Night Sky Network. In quite a variety of settings. 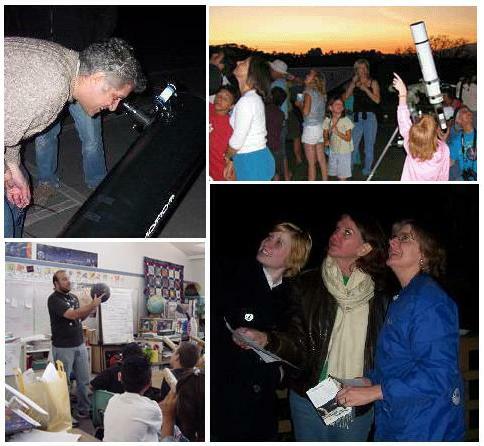 What kinds of events might your local astronomy club offer? 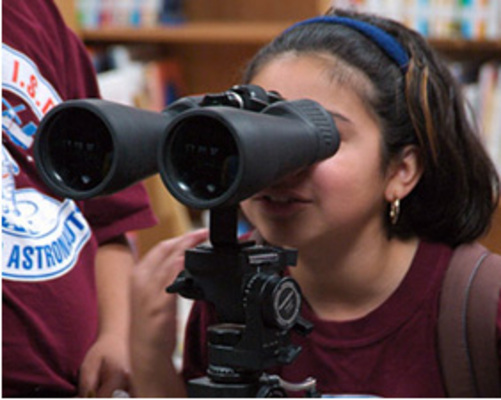 How are Night Sky Network member clubs encouraging girls' interest in astronomy and science? More Night Sky Network clubs join the elite list! 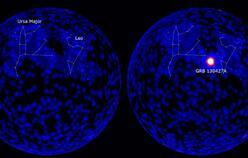 More Stars in the Night Sky Network! 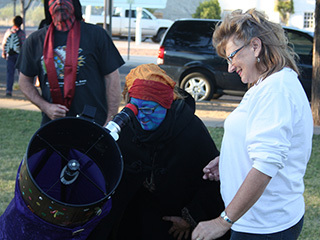 Night Sky Network astronomy clubs continue to provide unique experiences for their communities. Which clubs are the most active? Stars in the Night Sky Network! 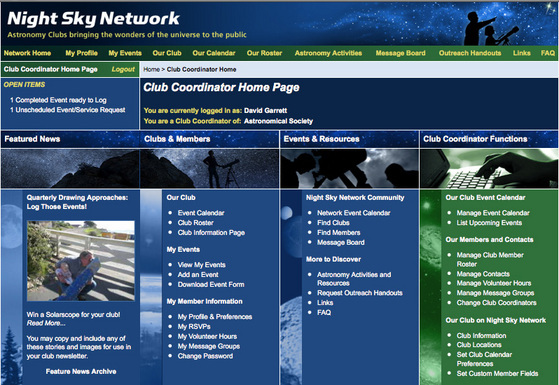 Night Sky Network clubs have posted over 350 events. Which astronomy clubs are among those at the top of the list? Why does NASA Put Telescopes in Space? Discover the answer from your local astronomy club! 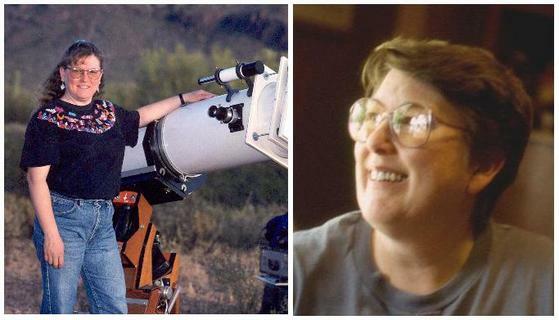 Teresa Lappin of the Tucson Amateur Astronomy Association and Jean Grendler of the Eugene Astronomical Society were selected to be the Night Sky Network representatives at the JPL Open House weekend in Pasadena, California. 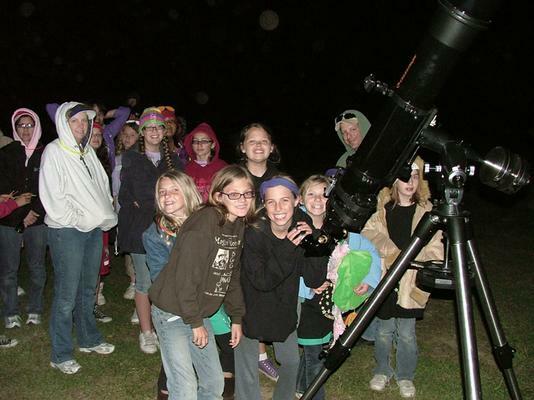 Astronomy clubs from around the country are members of the Night Sky Network. Is your area included? Over 170 astronomy clubs nationwide are ready to connect you to the universe! 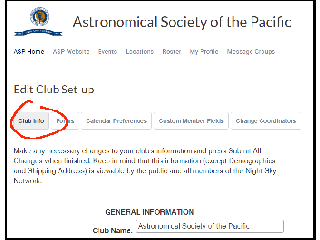 NASA and the Astronomical Society of the Pacific announce the official launch of the Night Sky Network, a national coalition of astronomy clubs engaged in public outreach. 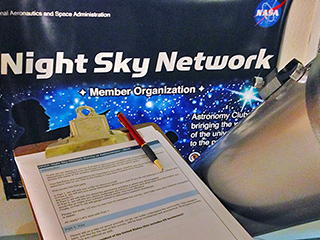 Amateur astronomy clubs may apply for free membership in the Night Sky Network. 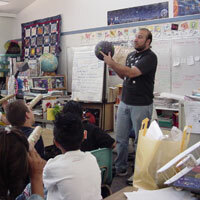 Bob Havner is an amateur astronomer in San Jose using PlanetQuest kit materials to enlighten students about NASA missions.